Charleston’s plantations are a window into the area’s past. Here you will find tales of wealth and prosperity, of love and war, and of suffering and survival. Before the Civil War, there were hundreds of plantations located outside Charleston, growing indigo, cotton, rice, and other cash crops. Charleston became wealthy from these plantations, but these riches were of course made on the backs of the slaves who were forced to work the fields. Many of the plantations near Charleston were either destroyed during the Civil War or ceased operations soon after as many become unprofitable without the use of slave labor. Today, several plantations and plantations homes, ranging from farmhouses to mansions, have been restored and preserved as museums and tourist attractions. Each of the Charleston plantations offer different experiences. 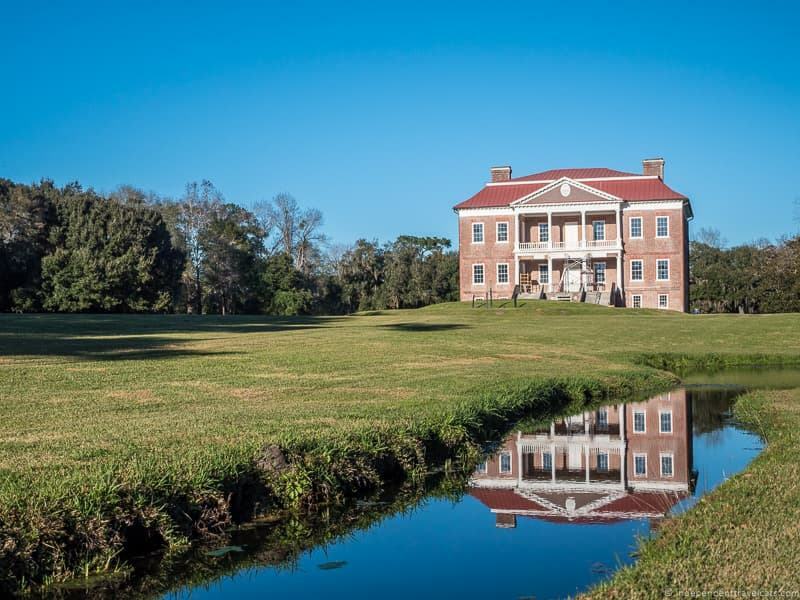 Whether you’re looking for an escape from city life, a walk in a beautiful garden, a glimpse of history, to learn about slavery and Gullah culture, or to see a working plantation in action, you can find it at one of these estates. We have visited five of the plantations around Charleston, and in this article we will give you all the details you need to plan your own visit to these plantations. If you are trying to choose which of the Charleston plantation tours to take, we’ll give you the information you need to pick the best one for you. 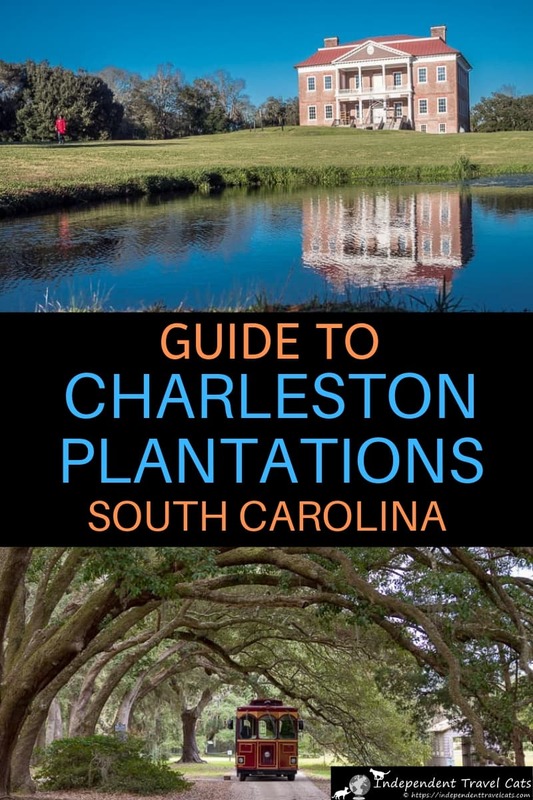 Here is our comprehensive guide to the Charleston plantations, complete an FAQ section, a short guide to each of the 6 plantations, and our own personal impressions and tips for visiting each of these South Carolina plantations! Best time of year to visit Charleston plantations? Cost of Charleston plantation tours? Charleston City Passes that include plantations? How to get to the Charleston plantations? Which plantations are closest to downtown Charleston? How do I book a plantation tour or ticket? How many plantations can I visit on a day trip from Charleston? Being respectful and aware during plantation visits? Best plantations for wheelchair users and those with reduced mobility? How to decide which plantations in Charleston to visit? Which Charleston plantations offer places to eat on site? Which plantations in Charleston offer overnight accommodation? Further resources about Charleston plantations? What else is there to do in Charleston South Carolina? Before we get into the details of each plantation, we want to give you some background on South Carolina’s plantations, and what you need to know before visiting them. In the 1670’s, English planters began to migrate from Barbados to the area now known as Charleston, South Carolina. They founded the city, then called Charles Town, and set up large plantations around the outskirts. In the antebellum period, it is estimated that there were over 2,000 plantations in South Carolina, most within the Lowcountry area. Over 300 of these plantations were in Charleston County. Many of the plantations near Charleston were set up either along the banks of the Ashley River or on the sea islands, such as Wadmalaw Island, Edisto Island, and Johns Island. Early plantations mainly grew indigo and rice which grew well in the coastal marshy conditions. The area became particularly known for its rice, and the use of tidal irrigation changed the landscapes of this area and make this a much more profitable endeavor. South Carolina was the leading rice producer in the country for about 200 years. In the 1800’s cotton also became a popular crop in South Carolina after the introduction of the modern cotton gin made it easier and more profitable to cultivate. 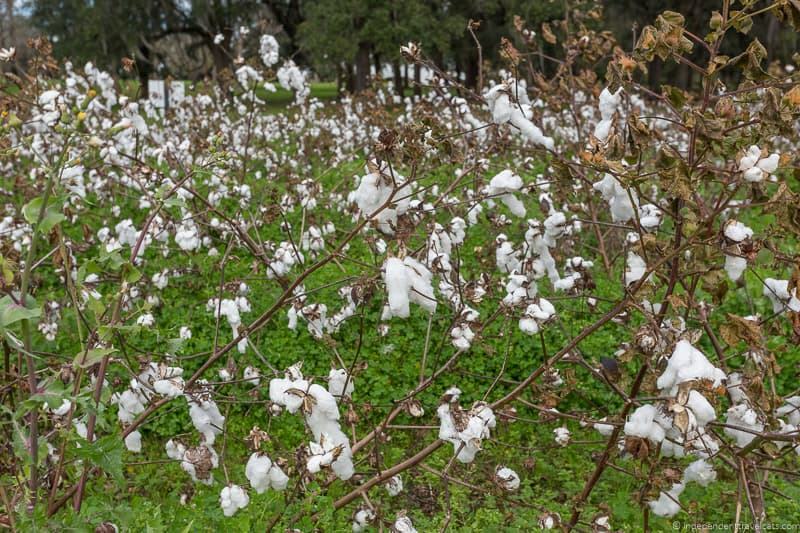 Sea Island cotton grown in the Charleston area became one of the most expensive and sought after cottons in the world in the 19th and early 20th centuries. These plantations were hugely successful and profitable, mainly because they were run using the cheap labor of African slaves. Enslaved blacks were forced to work in the plantation houses, fields, and even in the slave auctions in which they were sold. By the early 19th century, Charleston had become the national slave trade capital and by the start of the Civil War, about 10% of all slaves in the United States lived in South Carolina. In fact, about 57% of South Carolina’s population were enslaved blacks by 1860 according to Census data! Charleston became one of the wealthiest and most powerful cities in the United States, largely due to vast incomes made through the plantation system and slavery. But the plantation system would come to a quick halt at the beginning of the American Civil War, a war fought between the North (the Union) and the South (the Confederacy). The South lost the war, of course, and slavery was abolished by the Thirteenth Amendment in 1865. Most of the plantations in the Charleston area were looted and damaged by Union forces under the leadership of General William Tecumseh Sherman and many, like Magnolia Plantation and Middleton Place, were burned to the ground. Large sections of the city of Charleston also lay in ruins after the war. Those plantations that survived were devastated by the loss of slave labor, coupled with the fact that about one-fourth of the military-age white male population had died during the war. With no one to run or work the plantations, many of them fell into disrepair or were sold off piecemeal. Some of the antebellum plantation homes that did survive, or had been rebuilt after the War, were damaged or destroyed by the Great Earthquake in 1886. A small percentage of the plantations continued on, many relying on tenant farming and the use of cheap labor from former slaves. Many former slaves returned to work at plantations as freedman, working as tenant farmers and sharecroppers, after finding it very difficult to find work elsewhere in the now impoverished Lowcountry. A number of Lowcountry plantations continued to grow the prized Sea Island cotton; however, a boll weevil infestation in the 1920s virtually wiped out cotton crops throughout the southern United States. This caused many surviving working plantations to cease farming efforts and many fell into disrepair. In the 20th century a handful of plantations were bought and restored, either to be opened as public historical sites or for private use. Some were opened as historical museums, hunting resorts, or hotels while others are rented out for events and weddings. Currently about a half a dozen plantations near Charleston are open to visitors. Charleston is a year-round tourist destination, but it’s wise to avoid the area from June to August, when stifling hot temperatures and heavy humidity can make it unpleasant to be outside for too long. Charleston’s best weather, and therefore peak tourism season is from September to November. This is a beautiful time of year to visit the plantations, but expect more crowds and higher prices on accommodation. Spring is also a nice time of year when many of the plantation gardens will be in full bloom, but again, there will be some crowds. Winters in Charleston are mild, so also not a bad option, but check to make sure everything you plan to visit remains open as some plantation attractions are seasonal. We visited in late January so the temperature was cool and crowds were low, but it was not the best time for the gardens. Prices to visit a Charleston plantation vary greatly, and admission tickets range from about $15 per person to over $30 per person. Be sure to check what is included with the basic admission fees, some plantations include everything for one price, and for others you have to pay extra for things like house tours and different attractions. Costs for some plantations with all the add-on tours and attractions can be over $50 per person. All of the plantations offer discounts for younger children, and some also offer discounts for AAA membership, senior citizens, or local residents. There are two main discount passes in Charleston, and both can save you money if you plan to visit a number of Charleston’s popular attractions. The Tour Pass in Charleston includes entry into over 30 Charleston attractions, and currently include entry into Boone Hall (featured tour), McLeod Plantation, and Charleston Tea Plantation. If you plan to visit several attractions in Charleston, this pass will likely save you some money. We recommend that any first-time visitor check this one out. There is also the Heritage Pass which covers a total of 9 historical homes, plantations, and museums. However, it is not a great value for those primarily interested in visiting plantations as although it includes two Charleston plantations (Drayton Hall and Middleton Place), it only grants free entry to the grounds and gardens and does not include a house tour at either. Getting to any of the plantations will require some form of transport, as none are located within the city of Charleston. The simplest option is to bring or rent a car. This way you can visit as many plantations as you like, for as long as you like. There are many rental agencies at the airport and in downtown Charleston, such as Enterprise. All of the plantations around Charleston offer free parking to visitors. Public transit is not a convenient option for most of the Charleston plantations as there are limited bus services outside the city. However, you can get to McLeod Plantation Historical Site very easily from Charleston by bus. Currently it takes about 16 minutes to reach the plantation site from the Charleston Museum if you take Bus 31. 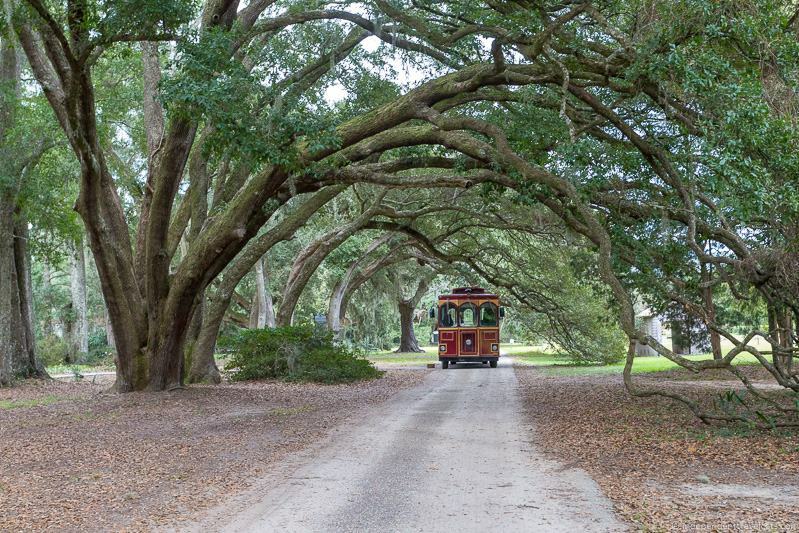 It is also possible to reach Boone Hall Plantation by taking public buses; however, it takes a long time and requires a 25 minute walk from the final bus stop. Not recommended. If you do not wish to rent a car, taxis are an option, and there are several companies in the area such as Green Taxi. Note that it can be difficult hailing one from off the street, so it’s a good idea to keep a taxi company’s number on hand. Ride share services, such as Uber, are also an option; however, be sure that you will be able to get a return ride. Some people who have used ride share services have become stranded at plantations because there were no ride options back into Charleston. If you are going far from the city center, pricing might become prohibitively expensive. So you may want to also consider booking a day tour that includes transport and admission prices which often costs less than going by taxi. For a full list of plantation day tours from Charleston, see our Charleston Plantation Tours section below. None of the plantations are located in downtown Charleston, as plantations by definition require a lot of space. However all of the plantations covered in this article are within a 45 minute drive of the city. McLeod Plantation Historic Site is the closest plantation and can be reached by a 10 minute drive or 20 minute bus ride from downtown Charleston. Drayton Hall, Boone Hall, Middleton Place, and Magnolia are all about a 30 minute drive away. Charleston Tea Plantation is about a 40 minute drive away. If you prefer to stay in downtown Charleston, we recommend visiting one or two of Charleston’s historic homes instead. These houses were built and lived in by the rich merchants, politicians, and plantation-owning families of antebellum Charleston. Similar to the rural plantations, most of these city mansions were run with the use of enslaved labor. They vary in architectural styles. A few of the houses we can recommend considering are the Edmonston-Alston House, the Calhoun Mansion, the Aiken-Rhett house, and the Nathanial Russel House. If you don’t want to rent a car in Charleston, we recommend taking a day tour to visit the area plantations. There are several day tours that offer round-trip transport from downtown Charleston. 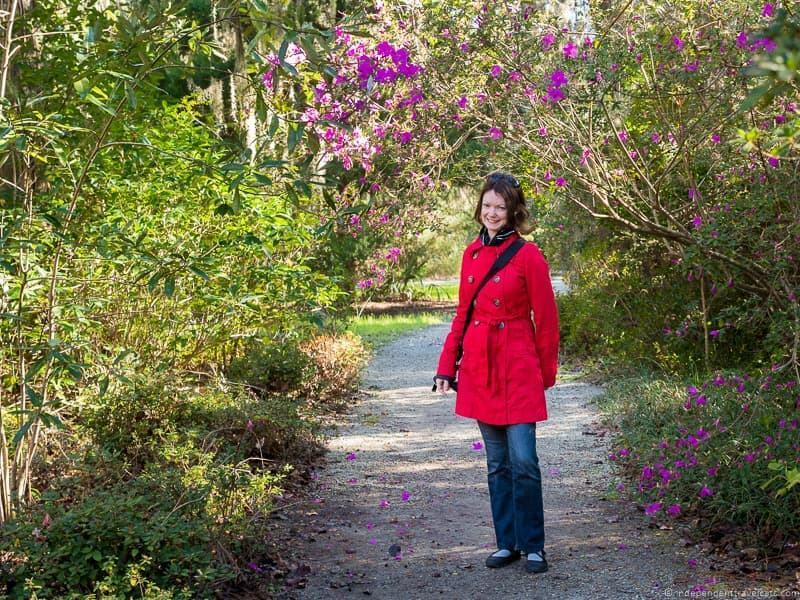 This well-rated half day tour from Charleston visits Magnolia Plantation and includes round-trip transportation as well as guided tours of the house, gardens, and grounds. 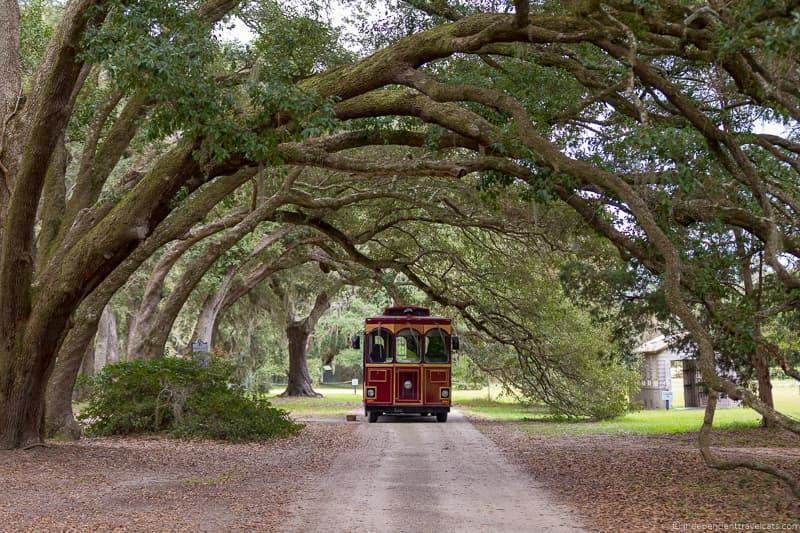 This half day small tour from Charleston includes a visit and trolley tour at Charleston Tea Plantation, plus a visit to Angel Oak Park, a winery, and a distillery on Wadmalaw Island. This 4.5 hour tour visits Boone Hall and includes a guided tour and all plantation entrance fees. 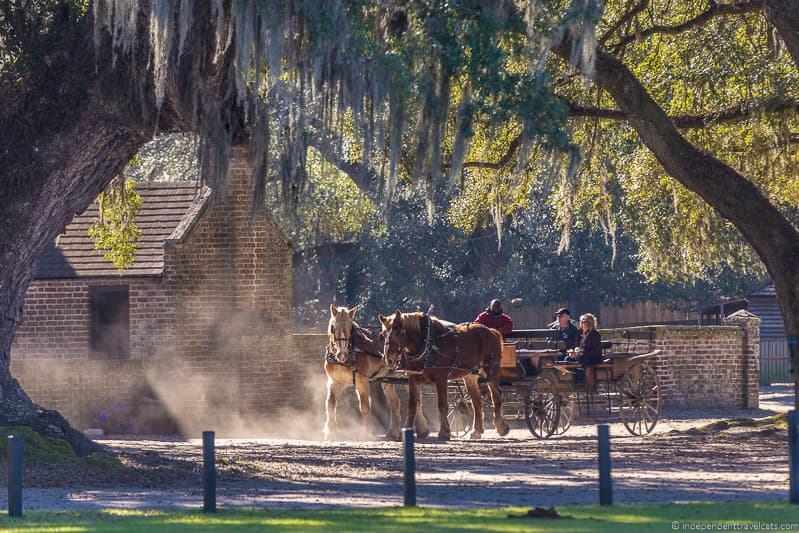 This half day tour includes transport by luxury motorcoach, admission and tour of Middleton Place, and a 3-course Lowcounty lunch at the Middleton Place Restaurant. Just be sure to book your day tour in advance as some require you to book at least 24 hours or more before you tour date. Most plantations don’t take timed reservations in advance, but most do allow you to book your admission tickets in advance online. You can sometimes get a small discount by pre-purchasing tickets, but note that most of these tickets are non-refundable. So I’d only purchase online if you are certain you want to visit. All plantations allow you to purchase admission and tour tickets in person on arrival. If you are traveling in a larger group, we do recommend that you call ahead and see if you need to make reservations. If you do not have a reserved tour time, I would advise showing up 30 minutes or so before the tour time you want to better ensure you get your desired time as tour times do sometimes sell out. If you have your own car, you could theoretically visit multiple plantations in a full day. However, given that most people spend 3 to 4 hours at a plantation, it is probably better to visit only one or two in a single day. To allow visitors enough time to explore, most day tours from Charleston only visit one plantation. If you want to visit more plantations in one day, we recommend looking at the plantations situated along the Ashley River as these are the most geographically close together. We recommend choosing 2 or 3 of the following: McLeod Plantation Historic Site, Magnolia Plantation, Drayton Hall, and Middleton Place. It is good to keep in mind that these places are historical sites that help illustrate two very different sides of the same history, one of the wealthy plantation owners and one of the enslaved workers of these plantations. While plantation tours can be entertaining and enjoyable, do remember that for some visitors the experience is more serious and can be emotional. These plantations were run using generations of enslaved people and visiting can be upsetting or cathartic for their descendants and other visitors. So please try to be cognizant and respectful of other people’s thoughts and feeling while visiting these sites. While all of the plantations offer wheelchair accessible toilets and the modern buildings (visitor centers, cafes, shop) are accessible, the real challenge is accessing the interiors of the historical buildings. Most of the Charleston plantation homes and other historical buildings are not wheelchair accessible. The only plantation house that is currently open to wheelchair users is McLeod Plantation Historic Site. They can also sometimes do tours in a golf cart for those who are not able to walk the grounds for the tour, but they recommend contacting them in advance to be sure a staff member can accommodate. The factory tour and gift shop at Charleston Tea Plantation are wheelchair accessible. Those who cannot climb the 4 steps into the trolley to do the trolley tour can call ahead to see if a tour can be arranged in one’s own vehicle. The main house at Drayton Hall is not currently wheelchair accessible, but all the other buildings are all wheelchair accessible including their museum, gallery, and slavery tour. There is also a video here and you can also about available supplemental materials for those who cannot do the house tour so you can see photos/videos of the interior. If you have specific needs or questions about accessibility at a plantation, I’d call in advance of your visit to avoid disappointment and to make any special arrangements as needed. Tour guides in most cases can not provide special assistance to guests (in terms of carrying walkers or wheelchairs, assisting people up stairs) during tours or walks, and it is strongly recommended that guests who need assistance visit with a companion. 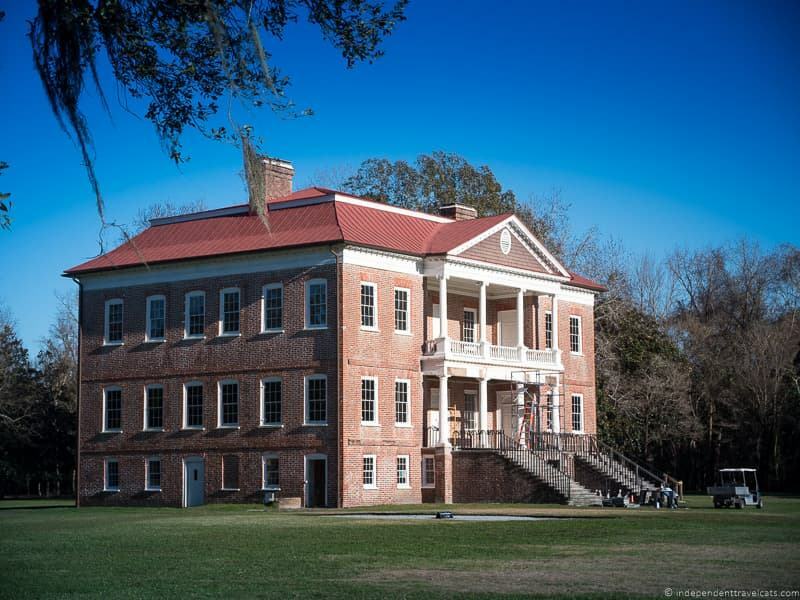 For each Charleston plantation in this guide, we have an Accessibility section which provides information on wheelchair accessibility, stairs, and services for those with mobility difficulties. This information was provided to us by staff at these plantations and we do our best to keep it updated. If you have visited any of these plantations as someone with reduced mobility (or with someone with accessibility issues), we’d love to hear about your experiences in the Comments section at the end of this article. 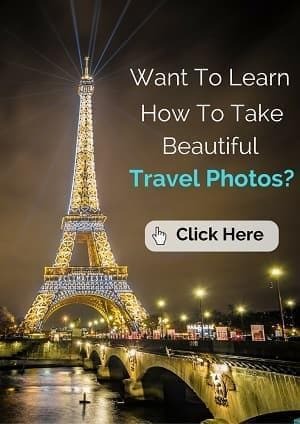 Your info can help future travelers! 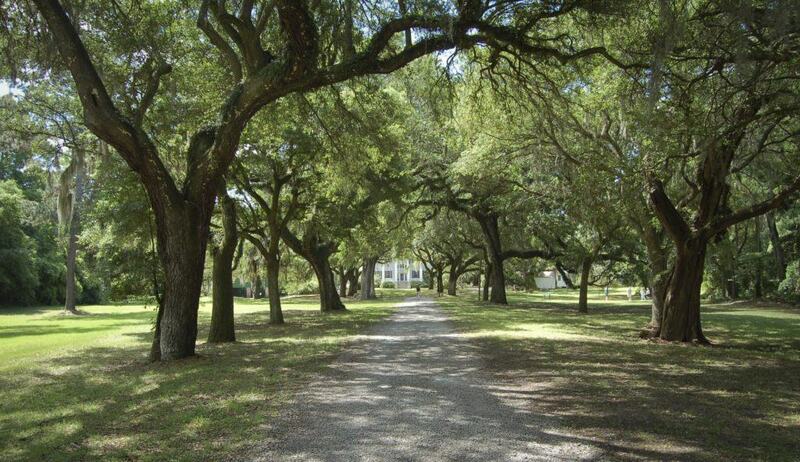 It can be difficult to choose which plantation you want to visit in Charleston. Most people only have time for one or two, and admission prices can be prohibitive to visit more than one, especially for large families. All of the plantations are worth visiting but they each offer different attractions and each has a different focus. Which plantation you choose depends a lot on what you are looking for in a plantation experience. The Charleston plantations with the best gardens would be Magnolia Plantation and Middleton Place. Magnolia Plantation is known for its well-preserved Romantic Style garden, which is designed to be an oasis away from the city. The gardens here are more wild and natural. It has stunning bridge-covered ponds and beautiful flowers. These were our favorite gardens of the Charleston plantations. 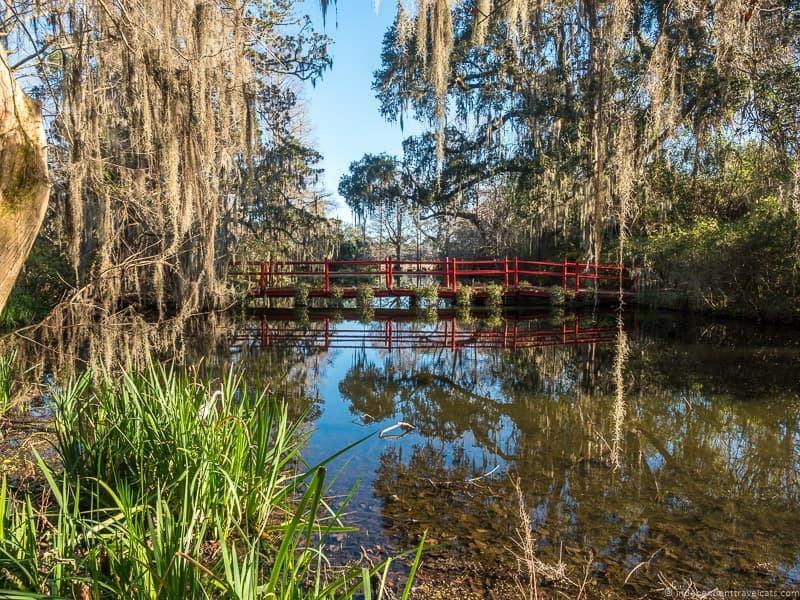 The Middleton Place Gardens also has award-winning elaborate and beautiful gardens. These classical gardens were inspired by the gardens of England and France in the 18th century. They are widely believed to be the oldest existing landscaped gardens in the United States. Both plantations have lovely gardens, and if trying to decide between them, it depends on whether you prefer more wild gardens (Magnolia) or more tended and landscaped ones (Middleton Place). If your main reason for visiting the plantations are the gardens, I’d try to come in Spring or when the flowers of most interest to you are in bloom. 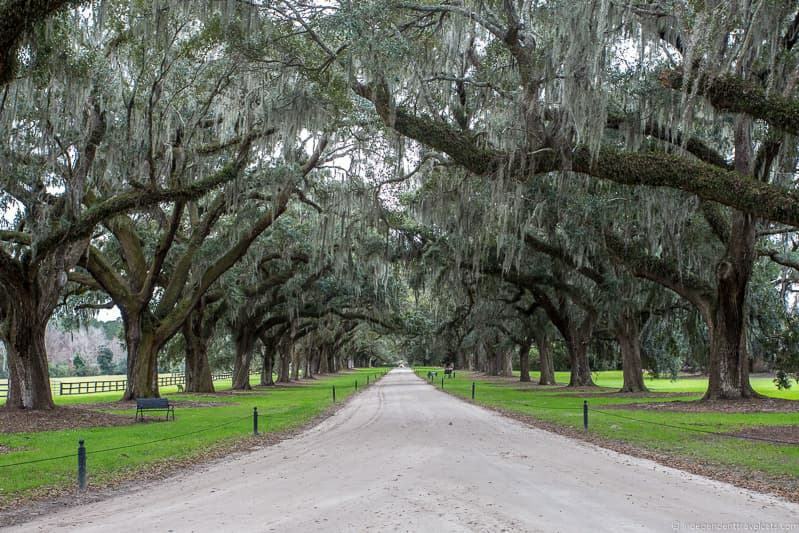 Although all six of the plantations have large old live oaks on site, the one with the most scenic oak alley is Boone Hall. 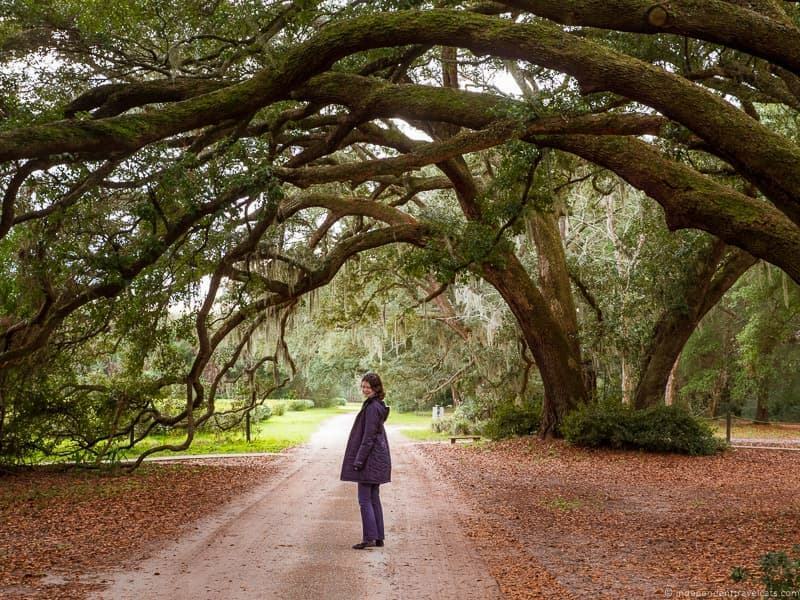 This oak alley has been featured in films like The Notebook. McLeod Plantation Historic Site also has a notable oak alley as well as the large McLeod Oak which is believed to be at least 600 years old. 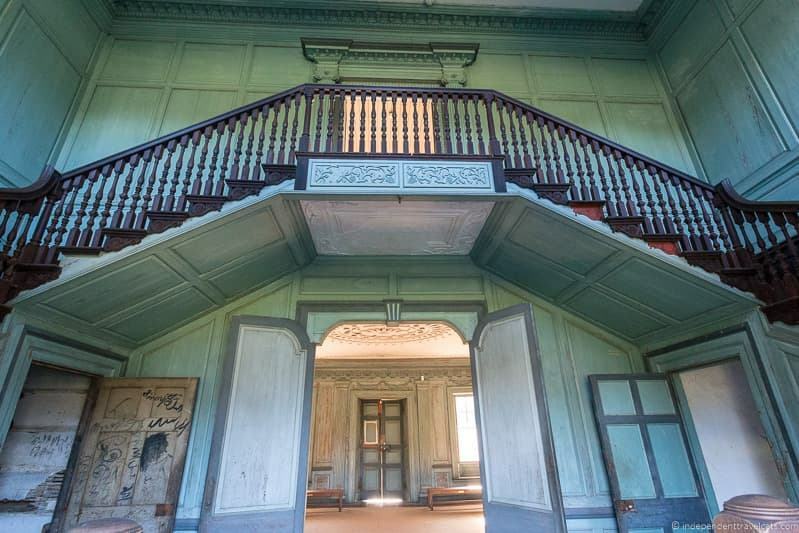 For those looking for an original plantation home, we recommend Drayton Hall. Drayton Hall is the oldest plantation house left in Charleston, and one of few plantation houses along the Ashley River to survive intact after the Civil War. Most of the others were destroyed or have been heavily restored or reconstructed. Drayton Hall was built before the Revolutionary War and is an excellent example of Palladian architecture. It has a very impressive exterior made of brick with white columns. 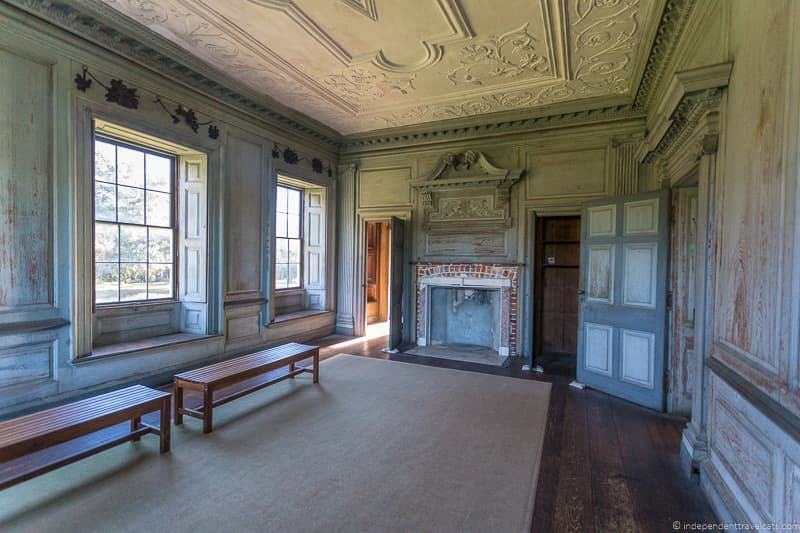 It has been conserved, but not restored, and has been left pretty much as it was left and is largely unfurnished inside. This allows visitors to better see and understand the architecture and construction of the house. McLeod also has an intact antebellum Georgian style plantation house on site, although it underwent significant changes and additions in the 20th century. This is a good plantation house to visit to get a good idea of the average “middle class” planter home, although the focus of tours here are on the crops and slavery. Like Drayton Hall, it is unfurnished inside. The main houses at Middleton Place and Magnolia Plantation were destroyed by the Union army during the Civil War, but both have Reconstruction era houses you can visit. At Middleton Place, a restored dependency building adjacent to the main house was turned into the family home and can be visited. At Magnolia, a summer house was moved here after the Civil War to serve as the owners’ home. Unlike antebellum plantations in some other areas of the country, such as the Louisiana plantations along the River Road, very few of the original antebellum grand plantation homes remain. If you are looking for a house like Scarlett O’Hara’s Tara (which was actually a movie set in California) in the film Gone with the Wind, you may be a bit disappointed. 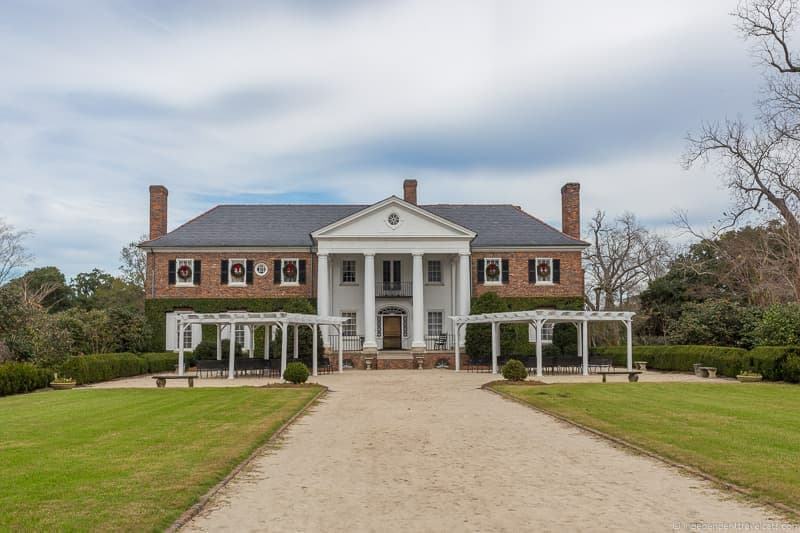 The closest is probably Boone Hall with its pretty oak alley and brick Colonial Revival mansion house, but the house only dates to the 1930’s. All of the plantations provide some information about slavery (except Charleston Tea Plantation of course), and in fact each of the 5 plantations with an antebellum history offer dedicated slavery tours or talks. But some definitely focus on it more than others. One unique aspect you’ll learn about in the Lowcountry is the Gullah culture (also sometimes called Geechee) developed by slaves in this area of the U.S., particularly South Carolina and Georgia. Slaves were brought over from various parts of West and Central Africa and they developed a Creole culture and language that enabled them to maintain parts of their own African cultures, traditions, and language. As a result they were less influenced by British-American culture than slaves in some other states. It should also be noted that former slaves and their descendants continued to live and work on most of the Charleston area plantations after Emancipation and well into the mid and late 20th century. So many plantations also present information about African American history through the 19th and 20th centuries as well. If your primary reason for visiting is to learn about slavery and African American history, we recommend visiting the McLeod Plantation Historical Site. The site’s main focus is on exploring and understanding local Gullah/Geechee culture, the slavery experience, and the history of African-Americans on plantations before, during, and after the Civil War. There is also a focus on understanding the cultivation and processing of the crops like cotton. 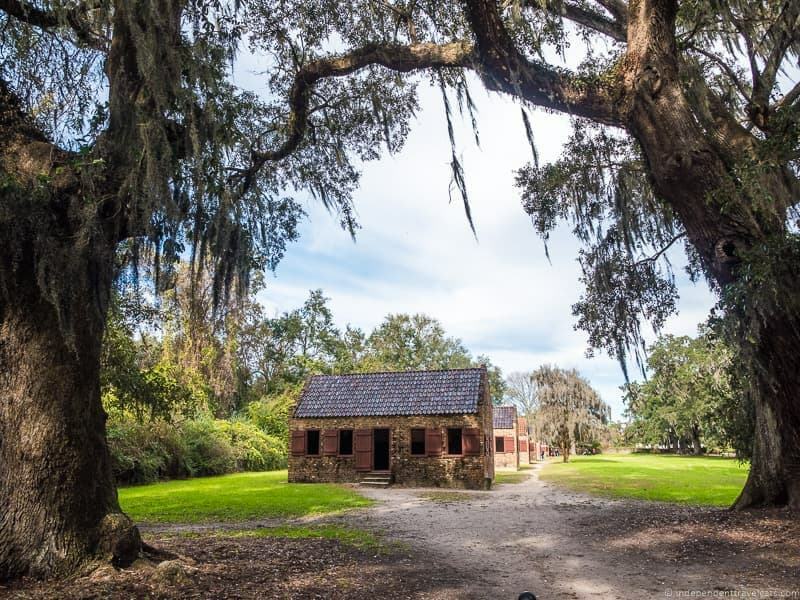 We also recommend Boone Hall Plantation which offers daily live talks about the lives of the slaves on the plantation, a self-guided tour you can take with exhibits in the former slave cabins, and a daily live presentations about Gullah culture in their outdoor theater. That said, Magnolia Plantation, Middleton Place, and Drayton Hall also all provide tours focused on the experiences of the enslaved and African Americans. So really it is up to you to determine how much you want to focus on learning about slavery at the plantations. If slavery and African American history tours and talks are of interest, be sure to check the daily schedule in advance at the planation you plan to visit to make sure you can fit in the tours during your visit. Of course, slavery wasn’t limited to plantations and rural life. In the city of Charleston, slave labor was used to built many of the houses, schools, government buildings, and churches, to do factory work, and to perform domestic duties in the homes of the wealthy. In Charleston, we recommend visiting the Old Slave Mart Museum which is a museum dedicated to sharing information about slavery. The museum is in a building which was part of a slave auction house from 1859 to 1863. A new museum is also being built in Charleston, the International African American Museum. 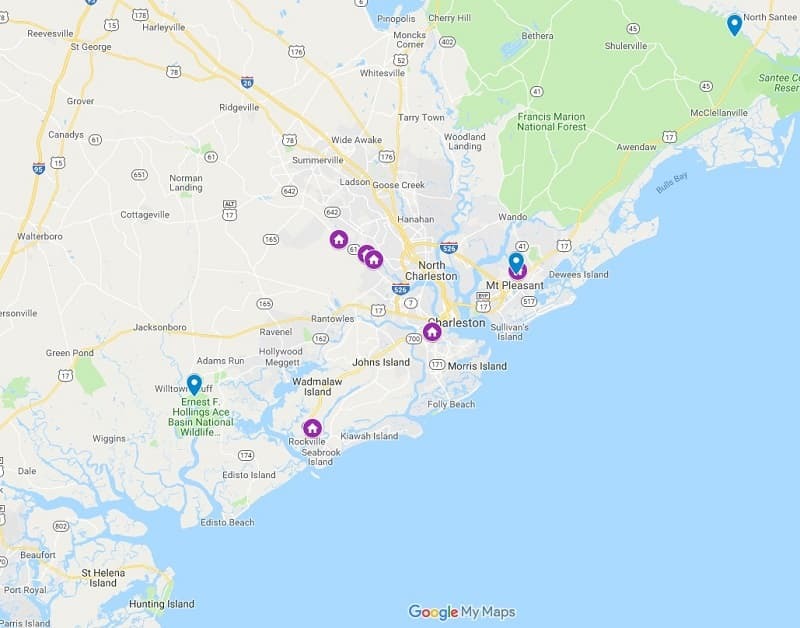 Those interested in learning more about Gullah culture, should check out the Geeche Gullah Cultural Heritage Corridor where a number of museums, historic homes, churches, schools, cemeteries, and other sites are listed that were/are connected to Gullah culture. The corridor runs along the coast from southern North Carolina to northern Florida. 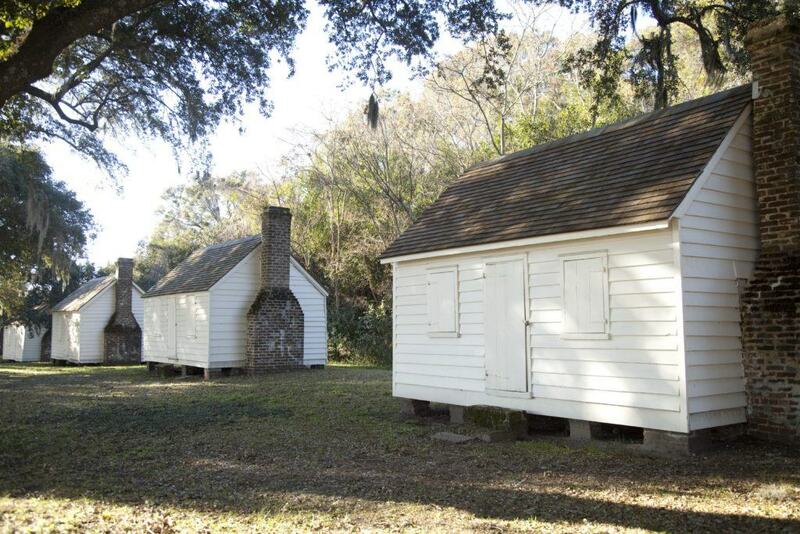 You may also want to check out the Slave Dwelling Project, which was started by Joseph McGill who began sleeping in former slave cabins in South Carolina. The group now organizes living history programs, education, and sleepovers in slavery-associated sites across the country. McGill’s first overnight stay in a slave cabin was at Magnolia Plantation and he also regularly leads the slavery focused tours here. There are usually several sleepovers scheduled at Magnolia each year. Of course the best way to learn more about slavery is to read accounts by former slaves. One large source of narratives comes from the interviews from the Slave Narrative Project that were collected by writers from hundreds of former slaves by the Works Progress Administration from 1936 to 1938. The Slave Narrative Collection includes about 2,000 interviews, 274 of these from South Carolina. You can find many of the transcripts online for free, or can buy them as a printed book online (some plantation gift shops also sell copies). We would recommend Magnolia Plantation for those who are interested in seeing nature and wildlife. In addition to the Romantic gardens, there is a nature tram tour, a boat tour, and the Audubon Swamp Garden. They also offer a specialized bird walk on Sundays led by a local ornithologist. We personally saw several species of birds, squirrels, turtles, and alligators during our visit at Magnolia. The plantation has a number of ponds and lakes, swampland, and is next to the Ashley River so changes of seeing waterfowl and other water critters are very high. Many of the other plantations do offer self-guided nature trails, including Middleton Place and Drayton Hall. The best plantations for those interested in seeing period furnishings, antiques, and family heirlooms from the antebellum period would be Middleton Place and Magnolia Plantation. 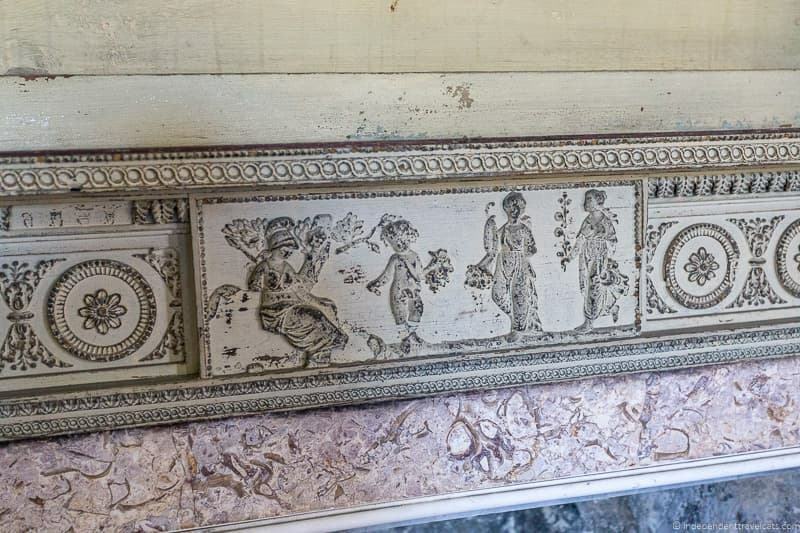 The Middleton Place house museum contains a large collection of furniture, art, documents, and family heirlooms that date from about the 1740’s to 1880’s. Almost all the objects had been owned by the Middleton family, and include family portraits, Charleston rice beds, and an extensive collection of English silver. Magnolia Plantation includes furniture, household objects, art, and antiques from the Drayton family who have owned the plantation since 1676. These objects are displayed across 10 different rooms and include portraits, quilts, and early American antiques. 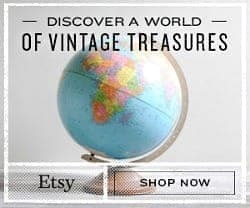 For anyone interested in antiques, Drayton Hall also deserves a mention here. Although the house itself is largely unfurnished, there is a collection of furnishings and artifacts from the Drayton family on display in the new Gates Gallery. This includes a c. 1750 desk and bookcase designed for John Drayton that are considered two of the most important surviving pieces of colonial furniture in America. 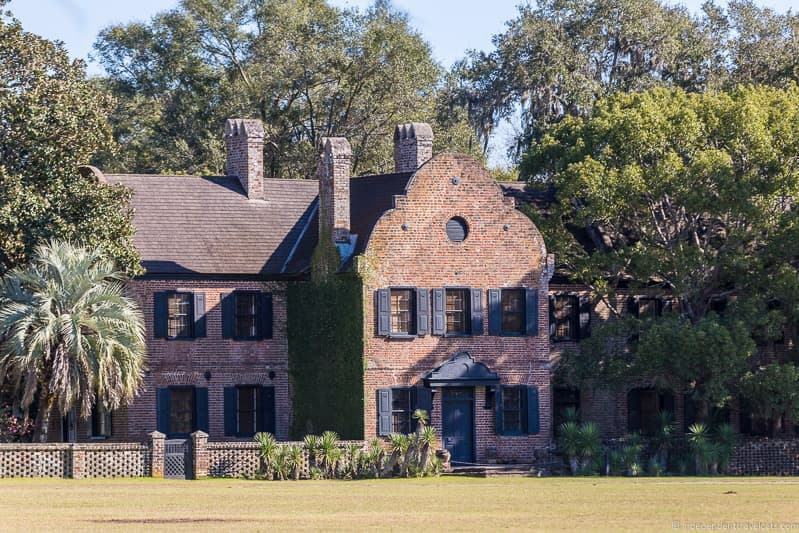 The house at Boone Hall only dates to 1936, but the current owners have collected a lot of antiques and period sympathetic pieces so that it resembles an antebellum planters’ home. However, only 4 rooms on the main floor are open to the public to tour as the top two floors are being used as a private residence. Plantations tours are not always a great fit for children, especially younger children, who can have a hard time standing still or paying attention during longer tours about history, slavery, architecture, and antiques. The two plantations with the more kid-friendly offerings are Magnolia Plantation and Middleton Place. Both also offer sandwiches and snacks on site. Magnolia Plantations & Gardens has a lot of space to walk and wander outside, picnic areas, a nature train, a boat tour, a small petting zoo with farm animals, a playground, and the Audubon Swamp Garden. Middleton Place offers lots of space for kids to wander around in the gardens, farm animals, carriage rides, and craftspeople doing different crafts demonstrations such as candle making and pottery. The two others places families might consider are Boone Hall and Charleston Tea Plantation. 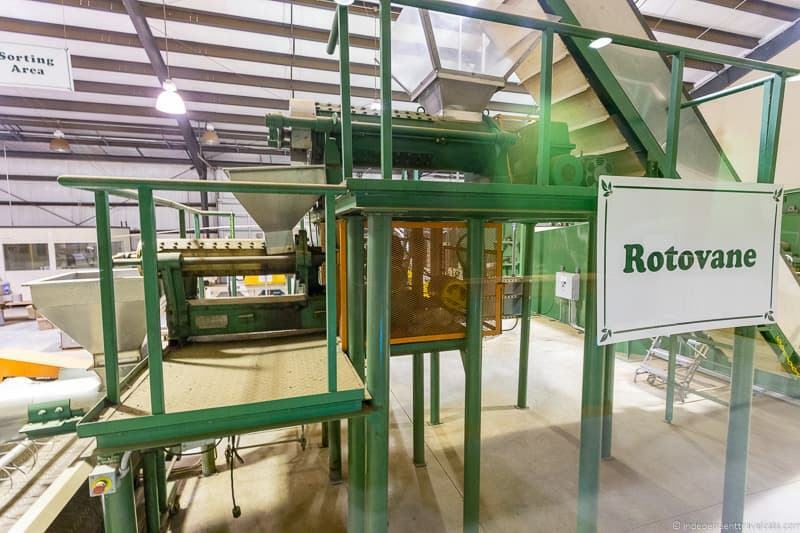 Charleston Tea Plantation offers a short video-guided factory tour and a trolley tour to see the tea plantation. Boone Hall Plantation has gardens, a tractor tour, outdoor Gullah theater talks, and a seasonal butterfly pavilion. To see a working plantation near Charleston, we recommend visiting either the Charleston Tea Plantation or Boone Hall Plantation. Charleston Tea Plantation is a real working plantation outside Charleston. It doesn’t have the history of the other plantations, but it’s interesting to see how a real tea farm operates. The trolley tour takes you around the fields and you get to see how tea is grown, picked, processed, and brewed. It’s also the only commercial tea plantation in America! Boone Hall is one of the oldest continuously working farms in the country, and has been producing crops for over 300 years. They no longer commercially grow indigo or cotton, but they raise a number of fruits and vegetables including strawberries, tomatoes, pumpkins, and asparagus. 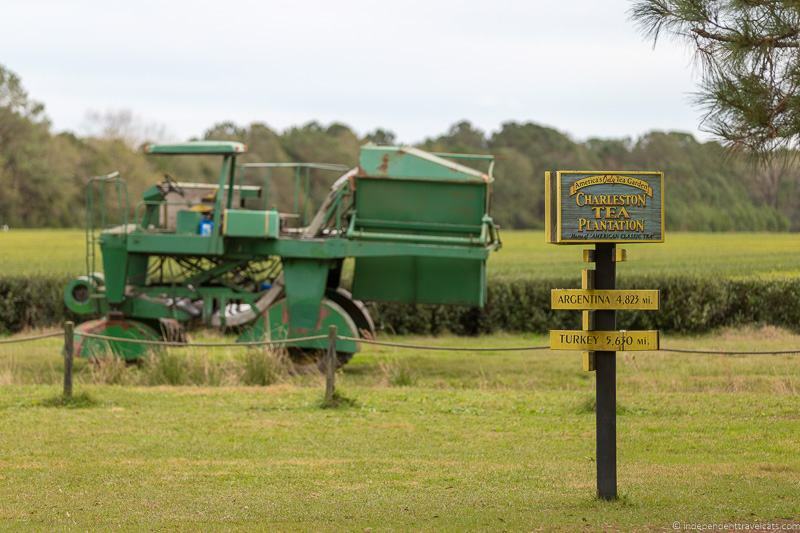 Visitors can take a tractor tour to explore the farm at Boone Hall and learn both about the historical workings of the plantation as well as the current farming operations. Fresh produce is available to purchase at the Boone Hall Farms Market near the plantation. At certain times of the year, visitors can even pick their own basket of fruit as part of the U-Pick-Em business. Although no longer a working plantation, McLeod Plantation offers tours about Sea Island cotton cultivation and processing. They also started growing a small amount of Sea Island cotton on the property in 2017 for educational purposes. Four of the plantations offer food on site. Magnolia Plantation and Drayton Hall both have casual on-site cafes where you can get sandwiches and hot food. Boone Hall has a small cafe with sandwiches, snacks, ice cream, and drinks. There is also a cafe at Boone Farms Market located a 5 minute drive away which has more hot food and meal options. Middleton Place Plantation has both a casual cafe and more formal sit-down restaurant. The casual garden cafe offers sandwiches, snacks, and ice cream. The Middleton Place restaurant serves seasonal, local Lowcountry cuisine. Reservations are recommended for dinner. Neither McLeod Plantation or Charleston Tea Plantation offer food, although Charleston offers free tea tastings and both sell snacks in their respective gift shops. Only one of the plantations, Middleton Place, offers on site accommodation. The Inn at Middleton Place is a modern, environmentally mindful hotel with sweeping views and access to the plantation’s 65 acres of nature. Despite having 55 rooms, it can book up quickly so plan ahead and book online. If you crave a historic hotel in Charleston, you can also consider staying at one of Charleston’s many historical hotels or inns, such as John Rutledge House Inn, Planters Inn, Mills House, Barksdale House Inn, Governor’s House Inn, or the Wentworth Mansion. Charleston has many options ranging from budget hotels to 5-star ones. We will break up the choices into options in central Charleston, and ones that are a little further out near some of the plantations. If staying in downtown Charleston, we recommend staying in or within walking distance of the Historic District if you can as this is where many of the city’s main attractions and restaurants are located. NotsoHostel – This well-reviewed hostel offers both dorm rooms and private rooms along with communal kitchen and bathroom spaces. This is the only hostel in Charleston that we know about and it is located within walking distance of the Historic District. Days Inn by Wyndham – This 2-star motor inn in the Historic District offers just the basic amenities, but the price for the location is excellent. It’s located just off Market Street and close to City Market and offers a great value for this area of Charleston. Barksdale House Inn – This 3-star historic inn was built in 1788. Each room is uniquely decorated with a grand 4-poster bed and a continental breakfast is included. If you are looking for a historical B&B, this one offers a good value. Church Street Inn – These 3-star well-appointed townhouses feature full kitchens, Wi-Fi, cable TV, and a 24 hour front desk service. Francis Marion Hotel – This 4-star historic hotel is set on lovely Marion Square and offers well-appointed rooms with flat screen TVs, coffee makers, and WiFI. Hotel offers an on-site full-service spa, fitness center, coffee shop, and the on-site Swamp Fox Restaurant and Bar. We’ve stayed here and can recommend. Mills House Wyndham Grand – This 4-star hotel in the city center offers spacious comfortable rooms, 24 hour front desk, fitness center, business center, on-site restaurant, and a large outdoor swimming pool. It’s located only a 5 minute walk from the City Market. We’ve stayed here and can recommend. Planters Inn – This 4-star luxury B&B is located in a 19th century house in the Historic District and offers a concierge service, flat screen TVs, bathrobes, and an on-site restaurant. The B&B is decorated in the 19th century style and is well-loved by guests for all the little extras it offers. Belmond Charleston Place – This 5 star luxury hotel offers all the luxury amenities you’d expect with 3 on-site restaurants, a bar, a full-service spa, fitness center, 24-hour front desk and concierge service, on-site shops, a rooftop terrace, and 2 pools. if you are looking for a room or apartment, AirBnB is also a terrific option when staying in Charleston, and you can check out local options here. You can save some money by staying outside of central Charleston, such as in Mount Pleasant, near the airport, or in Summerville. This is only recommended for those with cars as it can be difficult getting around without a car outside of the city. Inn at Middleton Place – This beautifully designed modern hotel is set within the gardens of Middleton Place Plantation and offers an on-site restaurant, spa services, and seasonal outdoor pool. Rooms include floor to ceiling windows to take in the surrounding views, and most include marble bath tubs and seasonal fireplaces. Guests of the hotel get free admission to the Middleton plantation and gardens, and it is also not far from Magnolia Plantation and Drayton Hall. Our pick if you want to stay outside of Charleston! Plantation Oaks Inn – This small relaxed 3-star log cabin style bed-and-breakfast offers comfortable rooms alongside a quiet tidal creek and a home-cooked breakfast each morning. It sits on what was Snee Farm Plantation, a plantation that was owned by Constitution signer Charles Pinckney. It is is within walking distance of Boone Hall Plantation and the Charles Pinckney National Historic Site. Another great option. Holiday Inn Express Suites – This 3-star hotel offers breakfast, a fitness center, and a seasonal outdoor swimming pool. A 7 minute drive from Boone Hall. SpringHill Suites by Marriott Charleston Downtown/Riverview – This riverfront hotel offers spacious rooms, an outdoor pool, 24-hour front desk, and complimentary breakfast. There is an evening shuttle that can take guests into the Historic District (small fee). It is located about a 5 minute drive from McLeod Plantation Historic Site, and is in a decent position for visiting Magnolia, Drayton Hall, and Middleton Place as well. 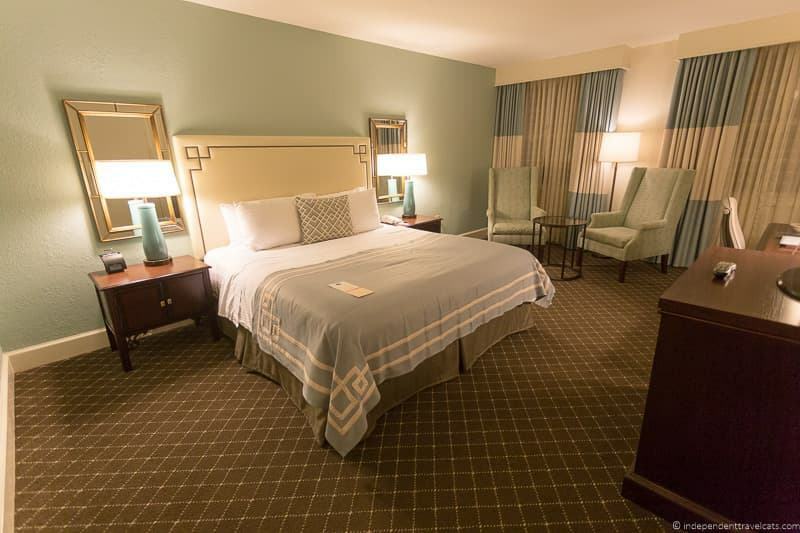 Hilton Garden Inn Charleston Airport– This solid 3-star hotel offers an on-site restaurant, fitness center, indoor pool, 24-hour front desk, and airport shuttle. This hotel is close to the airport and is not too far from Magnolia Plantation, Drayton Hall, and Middleton Place. Each plantation has its own website that will offer all you need to know about admission prices, tour times, whether tickets can be booked in advance, closure dates, restaurant openings, contact information, etc. 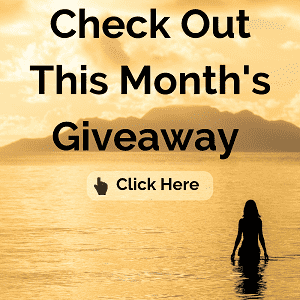 and these links are all included below in this post. To learn more about the plantations around South Carolina, this website is a good resource on finding historical information on South Carolina’s plantations. You might also consider checking out books about South Carolina’s plantations and historic homes. For more trip planning information check out our suggested 2 day Charleston itinerary and the local Charleston official tourism website. If you are traveling elsewhere in the Southeast, you might also want to take a look at our suggested Deep South road trip itinerary. For guidebooks, consider the latest edition of Lonely Planet’s Charleston Guide or Fodor’s Carolinas & Georgia Guidebook. Wander the Historic District – Historic houses, beautiful squares, and more await you with a leisurely wander around central Charleston. Don’t miss Market Street with its quaint shops and stalls, or a visit to the Old Slave Mart Museum to learn about the history of slavery in Charleston. If you want a guide to help point out the highlights and provide more context, consider a walking tour or horse-drawn carriage tour. Visit the Charleston Museum – The Charleston Museum was founded in 1773 and is commonly regarded as the first museum in America. It tells the story of Charleston and the South Carolina Lowcountry through a number of exhibits. The museum also operates two nearby historic homes that you can tour. Take a Stroll in Waterfront Park – Take a walk along the beautiful seaside esplanade within this 8-acre park. This is also where you’ll also find the the iconic pineapple fountain. Visit Fort Sumter – The first shots of the Civil War were fired from this island fort in Charleston Harbor. The Fort Sumter Historical Site is now operated by the National Park Service and makes an excellent short outing from the city. Take a Ghost Tour– A city with such a rich history is bound to be full of ghost stories. Consider taking a ghost tour to learn about the history, culture, ghosts, and supernatural hauntings of Charleston. Try the Lowcountry Cuisine – Some local dishes include she-crab soup, shrimp and grits, gumbo, Oyster Roast, local rice dishes, and crab cakes. Also try the South Carolina BBQ. We did this small group food tour on our first day which was a great introduction to the local food scene. Soak up the sun at Folly Beach– This beach is just a 20 minute drive from downtown and the perfect spot to watch the sunset, have a picnic, or frolic in the waves. To help you start planning your time in Charleston, take a look at our suggested 2 day Charleston itinerary. We have the full run down on the six major plantations near Charleston. We focus on those that are open year-round to the public, offer regular tours and other tourist services, and are of greatest interest to visitors. Do note that there are other plantations in and around Charleston. Many of these are either private residences or being used as private hire wedding and event spaces such as Lowndes Grove Plantation. But there are other plantation houses and plantation historic sites worth visiting that are open to the public and most are run by state, federal, or city government entities. These include Charles Pinckney National Historic Site, Hampton Plantation State Historic Site, and the Grove Plantation House at the Ernest F Hollings ACE Basin. These sites offer fewer tourist services but are recommended for those with greater interest and more time to explore plantations in the area. Below is a map of the Charleston plantations. You can click here or click on the map photo below to see or interact with the detailed map. Magnolia Plantation is one of the most visited plantations near Charleston. It was founded in 1676 by the Drayton Family, making it one of the oldest plantations in the country. Rice was the primary crop grown here and it was one of the first rice plantations along the Ashley River. The plantation is still owned by the Drayton family who have maintained the plantation through wars and natural disasters. The original house was ransacked by the British but survived the Revolutionary War. During the Civil War, Union troops set fire to the second house here in 1865, burning it to the ground. Magnolia Plantation is probably best known for its gardens which were planted in the 1840’s by Reverend John Drayton. He created a series of romantic gardens while recovering from tuberculosis to help his new wife Julia from Philadelphia feel more at home. Today these Romantic-style gardens are the oldest unrestored gardens in the country, best known for their large collection of camellias. 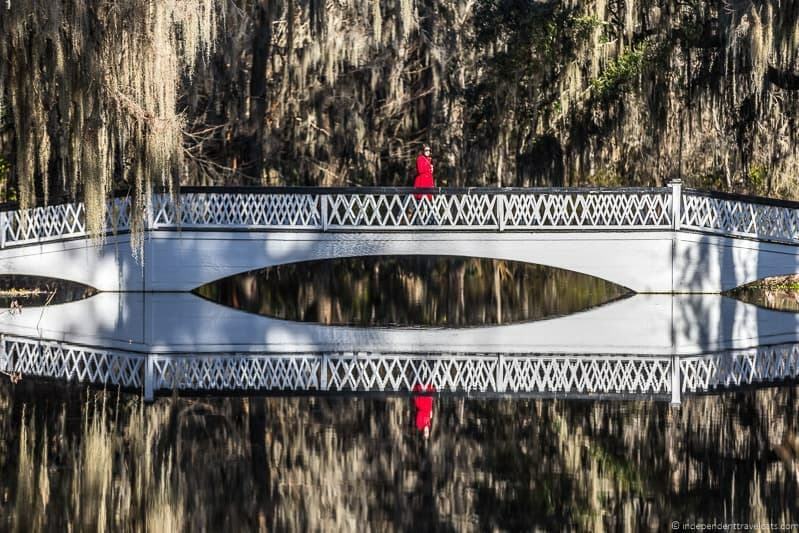 The gardens were first opened to the public in the 1870’s, making them the oldest public tourist attraction in the South Carolina Lowcountry. 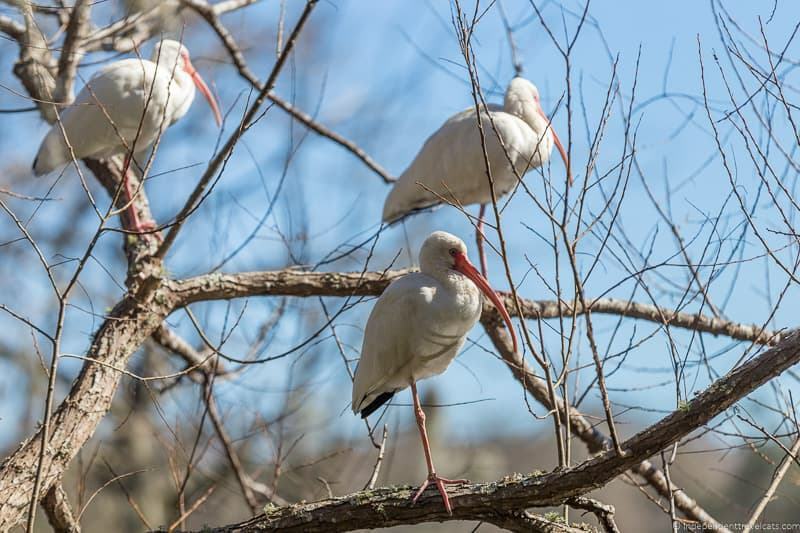 In addition to the Romantic gardens, there is also the Audubon Swamp Garden, where visitors have a good chance to see lots of waterfowl, including egrets and herons, turtles, frogs, and alligators. Magnolia is the plantation near Charleston that has been open the longest as a tourist attraction and it offers a wide and varied set of tours and attractions. Original Date of Main Plantation House: The first plantation house was built in the 1680’s by Thomas Drayton and his wife Ann Drayton. This original house was struck by lightning and burned down in 1810. The second house completed in 1811 was burned by the Union troops in 1865 during the Civil War. The current house was constructed on the site of the former house in the early 1870’s. Part of the house is believed to be from a pre-Revolutionary War hunting lodge owned by the Draytons in Summerville that was floated downriver to the current location. Architectural Style: It is believed that the original home was a large brick Georgian mansion and the second house was a 2-storey farmhouse. The current house has various architectural style influences including Victorian and Queen Anne style. Owners: The plantation was established in 1676 by Thomas and Ann Fox Drayton, and is still owned by the Drayton/Hastie family. The Drayton family lived in the current main house until 1975. Tours/Tour Guides: The Plantation House can only be visited via a guided tour. Additional tours offered include a Nature Tram tour of the plantation’s flora and fauna, a Nature Boat ride around the former rice fields, and a Slavery to Freedom tour that explores the former slave cabins, the African-American experience at Magnolia, and Gullah culture. There are also Sunday bird walks. The gardens and Audubon Swamp Garden can be toured on one’s own. Tour guides do not wear period costumes. Main House Furnishings: The house is fully furnished with furniture, household objects, art, and early American antiques from the Drayton family who have owned the plantation since 1676. Most of the objects date from the 18th to 20th century. Other buildings to visit on property: The main historical outbuildings are the four slave cabins (built in 1850’s) plus a fifth cabin built around 1900; these cabins were lived in until the 1990’s. The cabins can only be toured as part of the slavery guided tour. Other buildings on site include the office, theater, conservatory, garden center, and carriage house. Slavery Information: There is a guided tour offered of the restored slave cabins (4 1850’s cabins and one freeman’s cabin from 1900) which traces the African-American experience at Magnolia from slavery through the Civil Rights movement. Each of the former slave cabins was restored to represent a different time period: 1850 slave cabin, an 1870 freedmen’s home, a 1900 gardener’s home, a 1930 gardener’s home, and the 1969 Civil rights-era home of the Leech Family who lived here until the 1970’s. There is also an introduction to Gullah-Geechee culture. Gardens: There are extensive gardens at Magnolia Plantation, and these have been a tourist attraction for over 100 years, and some of the details date back to the plantation’s creation, making them the oldest unrestored gardens in the United States. The gardens are an outstanding example of the Romantic Garden movement, an Industrial-era gardening philosophy designed to emphasize beauty and escape over order and organization. Photography Allowed: Photography is allowed everywhere except inside the main house. Food: The Peacock Cafe serves breakfast, sandwiches, snacks, and drinks. Gift Shop: Yes, there is an extensive gift shop here. Accessibility: The main house is not wheelchair accessible, and requires 12 steps to access the main floor and another 12+ steps to reach the top floor. The slave cabins interiors are also not wheelchair accessible and each requires 2 to 3 steps. The shuttle that takes visitors to the slave cabins and the nature trolley are both wheelchair accessible using ramps. The cafe, petting zoo, boat tours, garden center, theater, Audubon Swamp, and most of the garden pathways are wheelchair accessible. There is a wheelchair accessible restroom located near the main plantation house. 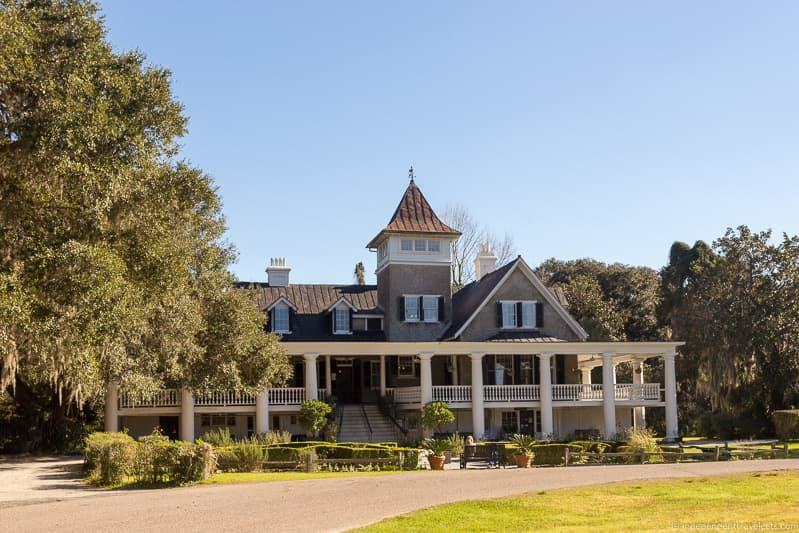 Days Tours Available from Charleston: This half day tour from Charleston visits Magnolia Plantation and includes round-trip transportation as well as guided tours of the house, gardens, and grounds. Lodging: No lodging on site. Crowds: Large. Magnolia Plantation is one of the most well-known and frequently visited plantations in Charleston. Most Unique: The award-winning gardens and the nature and swamp here really stand out. The fact that it has been owned (and is still owned) by the same family for 300+ years is also unique. We enjoyed our time at Magnolia Plantation, and liked that there were so many different things to do. You could easily fill a full day here if you did all the tours and saw everything at the plantation, and we recommend planning to spend at least 3 to 4 hours here. The basic admission ticket includes the orientation film, access to the historic gardens, petting zoo, maze, and plant conservatory. However, if you want to do the house tour, slavery tour, nature tram tour, boat tour, of Audubon Swamp Garden, these all cost extra. So if you are mainly interested in the gardens, then the basic admission ticket is for you. But you’ll need to pay more to do the rest of the tours. If you want to do all the extra tours and spend the whole day, I’d recommend getting the inclusive pass (if offered, not always available) during your visit as it saves you about $8.00 on the total cost. 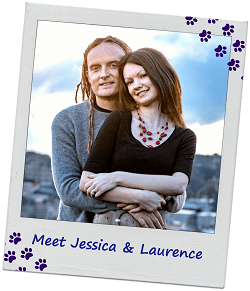 We recommend watching the 30 minute introduction video to start your visit. It provides a nice overview of the history of the plantation and the people who lived there. The gardens here are a highlight if you like more natural and wild gardens. We heard one person saying they look unkempt, so if you prefer landscaped gardens, these may not be the style of gardens for you. 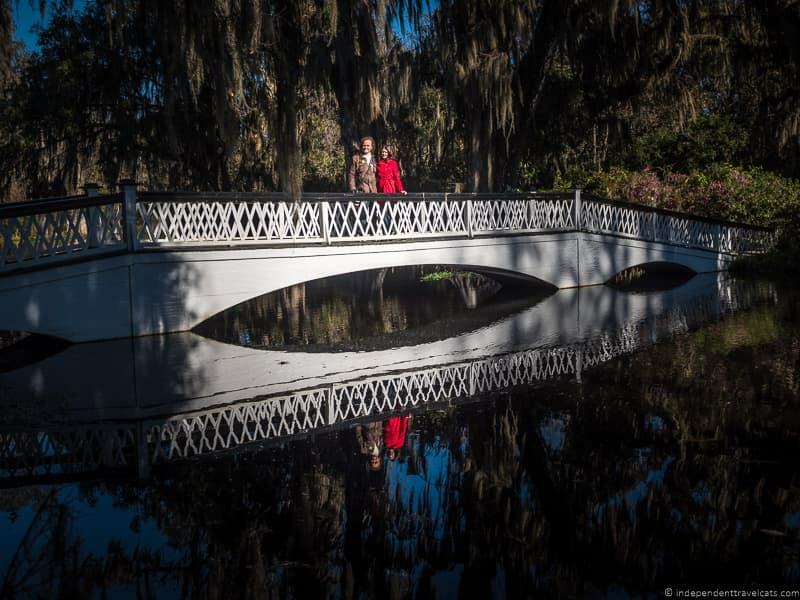 The bridges over the ponds here are also very picturesque and a popular place for engagement and wedding photos. This is probably the best plantation for those who enjoy nature, as you can also take the Nature Tram Tour, boat tours, and/or wander along the Audubon Swamp Garden. We saw a number of different bird species (e.g, woodpecker, egret, ibis, storks, ducks, heron), turtles, squirrels, and alligators. If you have an interest in birds, you may want to join the Sunday Bird Walks that are led by a local ornithologist. Be sure to bring insect repellent with you if visiting from Spring to early autumn as the ponds, old rice fields, and swamp areas are a prime breeding ground for mosquitoes and other insects. Magnolia Plantation is where Joseph McGill first started the Slave Dwelling Project and he has helped shape the tours here and he even leads them on some days! Definitely recommend taking the time to do the From Slavery to Freedom tour and viewing the exhibits in the former slave cabins. We enjoyed the house tour, but I think some people are surprised the house was built here after the Civil War and is perhaps not as lavish inside as they were expecting. If you are interested in the house, Drayton family, and their history, this is a good place to learn about it. If not, you may want to skip the house tour. Magnolia Plantation is a popular option for families and groups as it offers a lot of options for those with divergent interests. The gardens give young children plenty of space to explore and there is also a maze, playground, miniature horse pasture, petting zoo, and picnic area. Boone Hall Plantation was founded in 1681 by John Boone. Cotton and indigo were both grown here, and Boone Hall became one of the lead producers of pecans in the United States in the late 19th century. 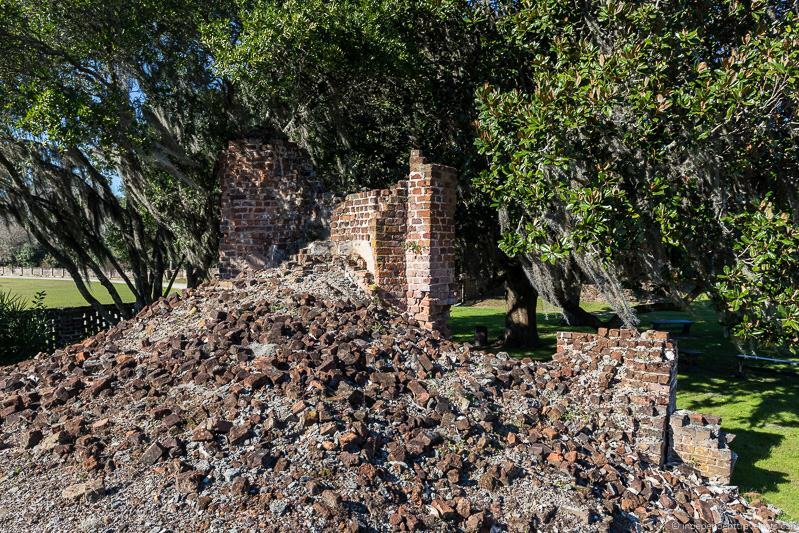 Although Boone Hall was notable for its crops, brick making was a huge source of wealth during the Horlbecks tenure. The Horlbeck brothers, using a large slave labor force, produced millions of bricks a year in the mid 19th century. They were also one of the few brickmaking producers still operating after the Civil War. Today, the plantation is still a working farm and crops have been continuously grown here for hundreds of years, making it one of America’s oldest working farms. Whereas in the past they grew cotton and pecans, they now grow a variety of produce like peppers, peaches, strawberries, and tomatoes. Visitors today can still see the working farm, and at certain times of the year can even help pick the fruit and vegetables. The plantation is also well known for its festivals, such as its Halloween events and its strawberry and oyster festivals. Its Lowcountry Oyster Festival is the world’s largest oyster roast. 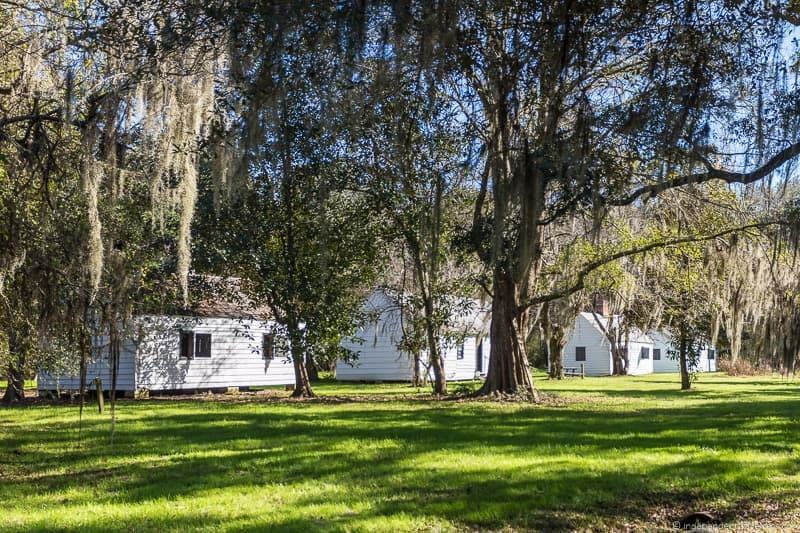 Although it doesn’t have an original house on site, it does have a number of antebellum outbuildings including well-preserved brick slave cabins and is well-known for its Gullah cultural program. 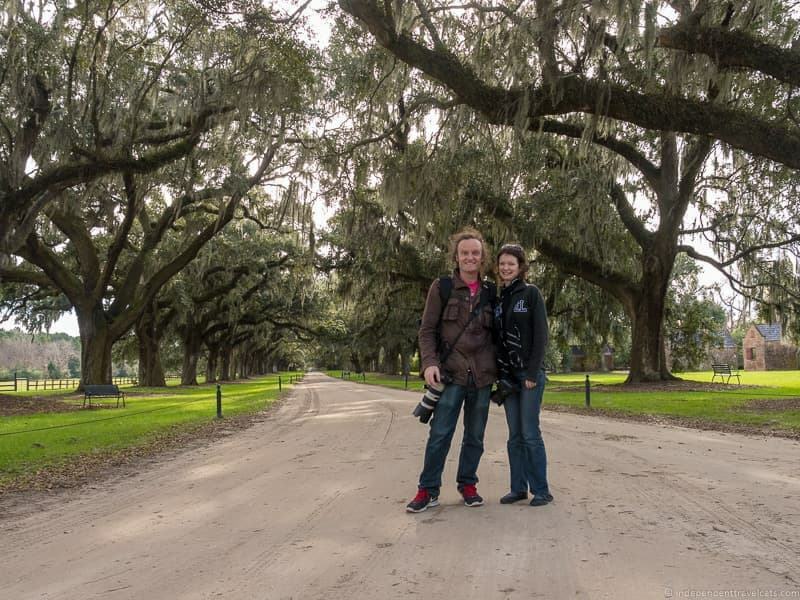 It also has a beautiful mature live oak alley, which is very photogenic. 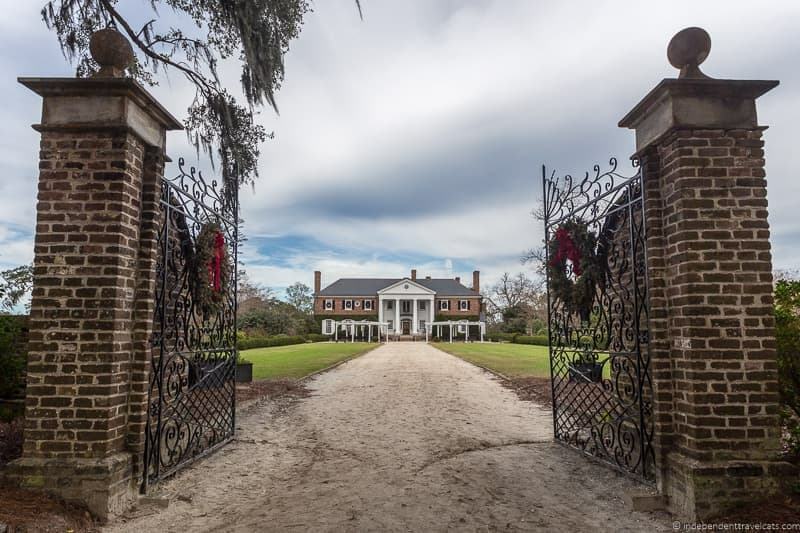 Boone Hall has been the plantation near Charleston used most for filming. It has appeared in TV series such as North and South, Days of Our Lives, the 1993 mini-series Queen (by Alex Haley) , and the 1994 Scarlett mini-series (sequel to Gone with the Wind). It was also used in the popular 2004 romantic film The Notebook as Allie’s parents’ summer house. Original Date of Main Plantation House: The original house was built by John and Elizabeth Boone circa 1680’s and was likely a small cabin. Then a second two-story frame house with a one-story front porch was built later. That two-storey house was demolished and the current house was built in its place in 1936 by former Canadian ambassador Thomas Stone and incorporates materials from the plantation’s old farm structures and salvaged historic bricks from the area. Main Cash Crop: Originally the main cash crops were indigo and cotton, but later the plantation became one of the largest pecan producers in the world. Brick making was also an important source of income throughout much of the 19th century. Working plantation today? : Yes, today, the plantation is often considered the oldest working plantation in the country, growing a variety of fruits and vegetables, including tomatoes, strawberries, pumpkins, peaches, peppers, and asparagus. At certain times of the year, the plantation allows visitors to pick and purchase their own fruit from the fields. A small field of cotton is also planted each year for demonstration purposes. Owners: The plantation has had a number of owners, the most significant being the Boones, Horlbecks, Stones, and McRaes. Boone Hall Plantation was founded in 1681 by John Boone and the Boone family lived here until 1811. The Horlbeck family owned the plantation from 1817 until 1935, and they greatly expanded the plantation’s brickyard and planted pecan trees. Thomas Stone and his wife owned it from 1935 to 1940 and built the current house. Harris and Nancy McRae purchased the plantation in 1955 and the McRae family still own the plantation. Tours/Tour Guides: The main plantation house can only be visited by a guided tour. However, only 4 rooms on the main floor are open to the public to tour as the top two floors are being used as a private residence. There are also tractor tours rides around the large farm that focus on the agricultural history and current farming operations, live slave history presentations, and live presentations on Gullah culture. Visitors can also explore a self-guided black history exhibit, front gardens, and butterfly pavilion on their own. House tour guides wear antebellum period costumes. Main House Furnishings: The first floor of the house is furnished with antiques and period sympathetic pieces to resemble an antebellum planter’s home, but the furnishings are not from the original antebellum house. Other buildings to visit on property: There are 9 brick slave cabins (built between 1790 and 1810), a cotton gin (built in 1850’s), smokehouse (oldest building on site c. 1750), and stables (1930’s). 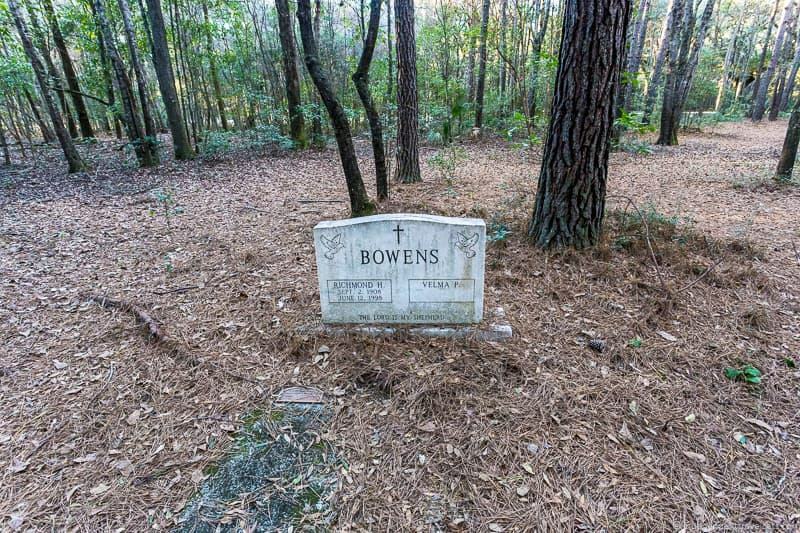 Along the Avenue of Oaks is a grave which is believed to be where Thomas Boone and his family are buried. There is also a hospitality center (seasonal), dock house, and a butterfly pavilion (seasonal). Slavery Information: Boone Hall offers daily live talks on both slavery and the Gullah culture. The 9 former slave cabins are unique in that they were built from brick (most slave cabins were built from wood) and each contains different exhibits about slavery and African American history that you can visit on a self-guided tour. 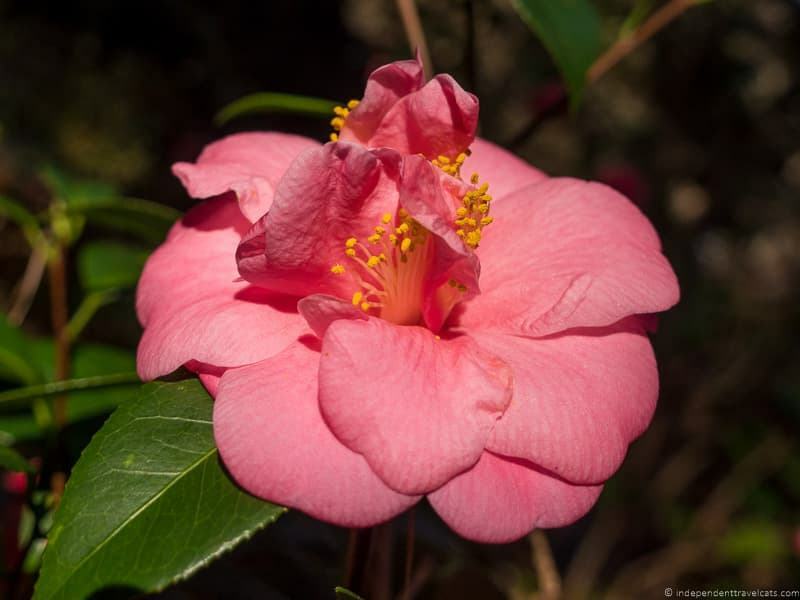 Gardens: Yes, there are gardens located in the front of the house that form a butterfly pattern, where you can see heirloom roses as well as azaleas, camellias, and other flowers. The gardens attracts butterflies during the warmer months. You’ll also see the beautiful 3/4 mile long Avenue of Oaks leading to the house. Food: Yes, there is the Butterfly Café which offers a limited selection of sandwiches, snacks, ice cream, coffee, and drinks. Nearby is the Boone Hall Farms Market (2521 N Hwy 17, Mt Pleasant, SC 29466) which sells produce from the plantation farm and has a cafe where you can get hot meals. Accessibility: The house is not wheelchair accessible, and requires 6 steps to get inside and another several steps to visit all the rooms. The slave cabins each have 2 to 3 steps to get inside and the trolley requires 6 steps to get inside. The paths throughout the grounds and gardens are partially wheelchair accessible but some are sand or grass which can be difficult for wheelchair users. The Gullah Theater, garden center, and gift shop are wheelchair accessible and there are wheelchair accessible bathrooms on site. Days Tours Available from Charleston: This half day tour visits Boone Hall and includes a guided tour and all plantation entrance fees. Lodging: No accommodation on site. Crowds: Moderate to Large. Can be very busy, especially during events. We recommend checking the events schedule as events will mean larger crowds and that regular plantation tours and activities may be suspended. 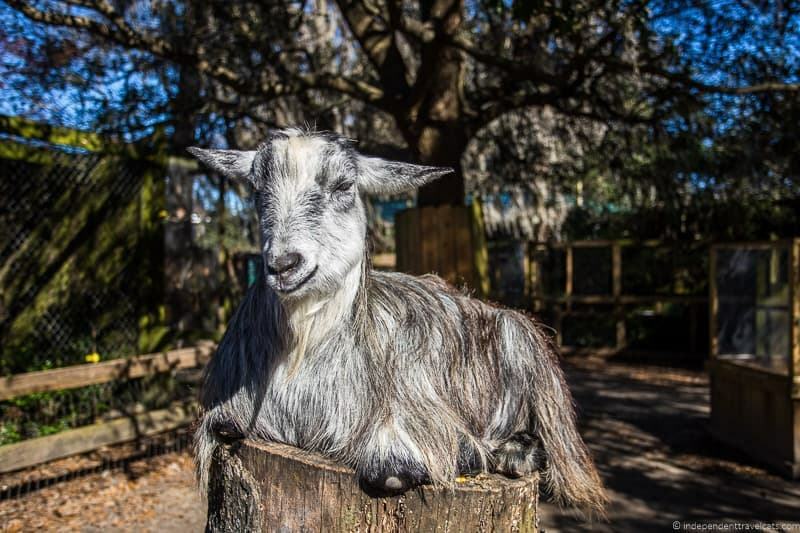 Most Unique: It is one of the oldest operating farms in the United States, unique factors are its beautiful Avenue of Oaks, its well-preserved brick slave cabins, and the Gullah live presentations. Boone Hall Plantation is a popular choice for those looking for a plantation to visit from Charleston. One reason is that the ticket price includes all the offered tours and attractions, so you don’t have to pay extra to visit the house or take the tours. This plantation is also a popular choice because of its scenic oak alley, its appearance on popular TV shows and films, and its photogenic house. It also offers a variety of tours from the house tour to the slavery talks to the tractor tours of its farm. For locals, it is also a popular spot for annual festival events. One thing that disappoints some visitors is the house tour. I think a lot of people see a photo of the house and assume that it an antebellum house and that they will get to fully explore the inside of the house. But the house only dates from 1936 and although it is furnished with antiques, these are not original to the house. Visitors can only currently see the 4 rooms on the ground floor as the top floors are a private residence. So if you know this before you go, you won’t be disappointed! If you decide to visit Boone Hall, we’d recommend at least 3 hours here, but you can easily spend half a day. We recommend coming early enough to be able to do all the plantation has to offer and especially recommend catching the Gullah presentation here as it is a highlight of the tours. If you are here for lunch, there is also a picnic area where you can either grab some food from the little cafe or enjoy your own packed picnic lunch. Or you can stop at the Boone Hall Farms Market nearby after your visit. If you have time, we recommend stopping at the nearby Charles Pinckney National Historic Site run by the National Parks Service. Charles Pinckney was a principal author and signer of the constitution and the site is part of Pinckney’s Snee Farm, which was a rice and indigo plantation. The 1828 cottage here serves as a museum and visitor center. McLeod Plantation was one of the original plantations on James Island dating back to the 17th century, and it played a role in the American Revolution, Civil War, and Reconstruction. Today it is a 37 acre park dedicated to Gullah heritage and African American history. Opened to the public in 2015, visitors can take a guided or self-guided interpretive tour of the site to learn more about the daily lives of the enslaved, Gullah culture, the lives of African Americans after the Civil War, and the cultivation of the land, particularly the growing of cotton. 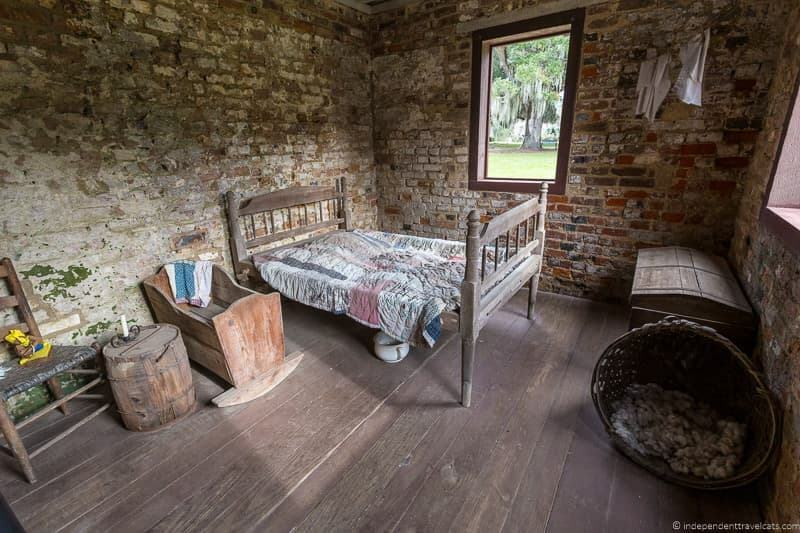 Visitors can tour the original plantation house and contrast it with the living conditions in the slave quarters. They can also learn about historical daily life and the role of slavery and cotton in South Carolina history. This plantation also shines a light on the role the Civil War and Reconstruction period played in plantation and African-American history. There is little focus here on the lives of the owners, architecture, or house furnishings, but this is probably the best place to visit if you want an unvarnished view of African American life on a plantation and to learn more about Gullah culture. The plantation focuses not only on the lives of the enslaved but also the lives of the formerly enslaved and their descendants after the Civil War to the 21st century, which is a time period less often mentioned during plantation visits. Architectural Style: The house is Georgian in style although additional features and additions have changed the look of the house over time, including the addition of wings to be used as a garage and for storage in the early 20th century and a 2-storey Roman Doric portico in 1926. The portico was added to the rear facade, and the rear is now used as the front of the house. These later changes were made to make the house appear more grand. Main Cash Crop: The plantation was used to grow indigo and cotton, and to raise cattle. The McLeods grew cotton until 1922 when the crop was wiped out by the boll weevil. Working plantation today? : No, although a small area of Sea Island cotton is being grown on the plantation again as a project by volunteers and staff for demonstration and educational purposes. Owners: The estate has been around since the late 17th century, and the property changed hands several times during the 18th and 19th centuries. It was purchased by William Wallace McLeod in 1851 who had the current house built and many of the agricultural buildings. During the Civil War the plantation was used as a headquarters for Confederates troops and then by Union troops. After the war, it was used as a local field office for the Freedmen’s Bureau before being returned to the McLeods in 1870. The final private owner, William E. McLeod died in 1990. 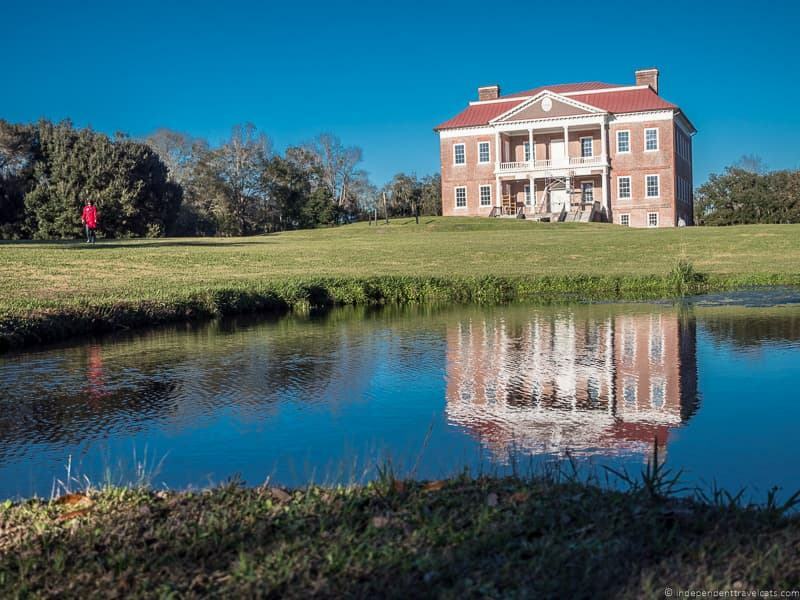 The plantation has been owned and managed by the Charleston County Parks and Recreation since 2011; they opened it to the public for tours in 2015. Tours/Tour Guides: The McLeod Plantation Historic Site can be visited as part of a guided tour (included with admission) or can be done as a self-guided tour if you prefer (there is a phone app and signs to guide visitors). Regular 45-60 minute interpretive guided tours of the site are available multiple times a day that take place outside in the grounds. These tours are focused on Gullah culture, the lives of the African Americans who lived here (both during slavery and after Reconstruction), and the cultivation of the land. You can visit the inside of the main house on your own as it is not included as part of the tour (only the first floor is currently open to the public). Tour guides do not wear costumes. Main House Furnishings: There is little to no furnishings in the main house or outbuildings. Other buildings to visit on property: There are a number of outbuildings on site, including five former clapboard slave cabins with brick chimneys (late 18th century or early 19th century), a larger sixth cabin was built later, a cotton gin house (19th century), dairy (19th century with 18th century cellar), kitchen (19th century), and a 4-person privy. Most of the buildings continued to be used into the 21st century so some contain modern materials and features. Note that the interiors of the outbuildings can not be visited for safety reasons, but some are open for visitors to see the inside of them (from outside) and some house exhibits. There is also a slave cemetery on site, as well as the newly-built welcome center and pavilion. 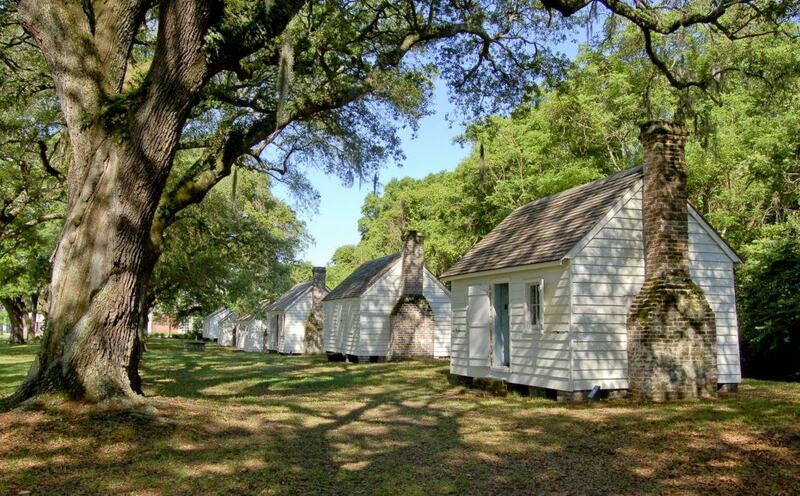 Slavery Information: The entire site is primarily focused on the African American slaves and tenants (from 18th century to 1990) who lived here and the Gullah culture. The regular guided interpretive tours here are the best place to get this information. There are also cabins on site that provided homes to African Americans from before the Civil War to 1990. There is also a slave cemetery that was re-discovered in 1996 which contains about 100 graves of people who are likely slaves at McLeod although much is unknown about the site and burials here. The site has been dedicated as a Sankofa memorial garden. Gardens: There are no manicured gardens here, but there is an oak allée and the huge McLeod Oak tree, which is thought to be more than 600 years old (perhaps even 1,000 years!). Food: No, although a limited selection of snacks and drinks are available for purchase in gift shop. Gift Shop: There is a gift shop in the Welcome Center. Accessibility: The first floor of the main house is wheelchair accessible by using a wheelchair lift. The Welcome Center, gift shop, picnic pavilion, and toilets are wheelchair accessible. Many of the paths are gravel and walking tours go onto grass so can be difficult for a wheelchair. It is possible to arrange a golf cart for those with limited mobility to see grounds, but this should be arranged in advance of your visit to guarantee availability. Days Tours Available from Charleston: We haven’t found any tours that include a visit to McLeod, but the plantation is easy to reach by public bus from downtown Charleston. Crowds: Low to Moderate, this site is the most recently opened and is typically less crowded than other plantations. Most Unique: The focus on African American history, Gullah culture, and land cultivation. This is the only plantation on the list we have not visited as it opened just after we were last in Charleston, so we cannot share our own personal impressions. However, it is exciting to know that this site has decided to focus on the subject of slavery and African American life which has often been whitewashed at plantations. It is notable to point out that the first museum in the United States to focus on slavery was Whitney Plantation in Louisiana which only opened to the public in 2014. We have visited there and it was surprising to know that it took so long to have a plantation attraction that is more focused on the lives of the enslaved rather than the owners or the history of the plantation buildings. 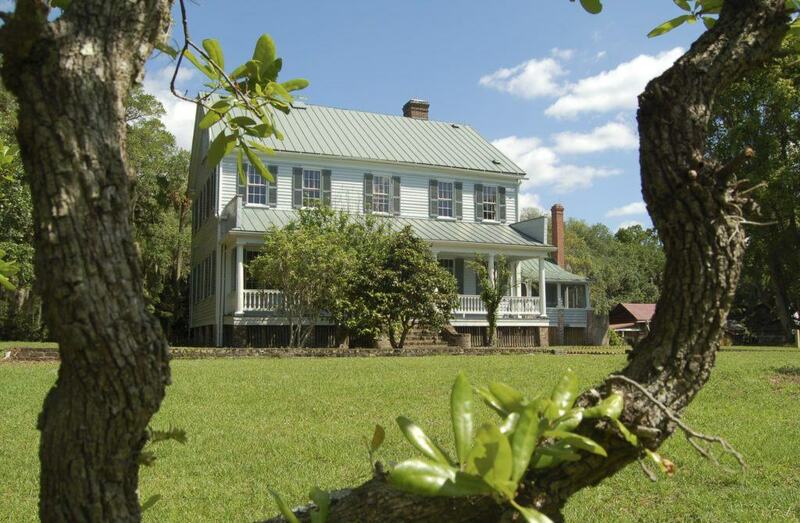 Tours at McLeod Plantation focus on the history of African Americans in relation to the plantation, understanding Gullah culture, and the cultivation of cotton. Guides also share information about past residents to try to give voices to the history and also point out buildings and artifacts when relevant. For example, at the gin house one can see the fingerprints of an enslaved child who would have turned the 18th century bricks used in the foundation of the gin house. The tours primarily take place outdoors on the grounds and do not visit the inside of the house or outbuildings. The outbuildings are currently not open to the public for safety reasons, but several have their doors or windows open so that the inside may be viewed from the outside. Some of these will likely open to the public in the future after more stabilization work is done. Although the main house is not the focus of the tours here, the house is notable for being an original antebellum house built for the McLeods. 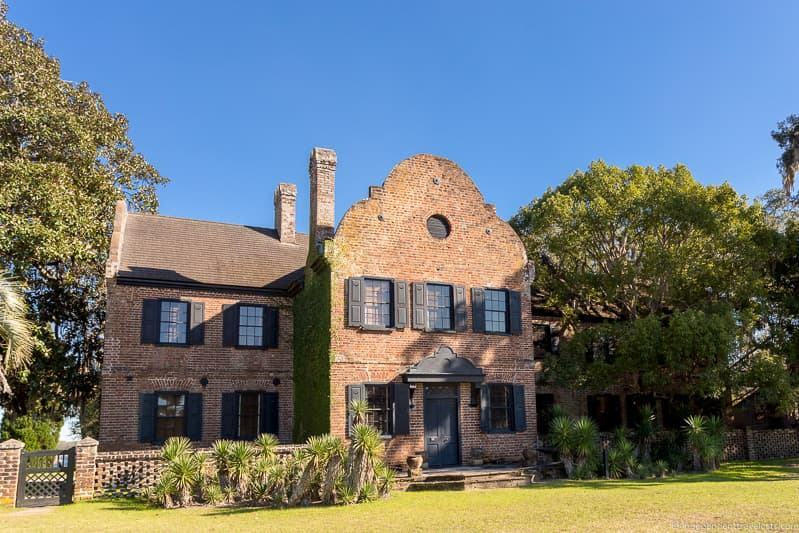 This is one of only a few surviving original antebellum plantation houses in the Charleston area, although there were significant modifications made to the exterior and interior of the house over the centuries. For those who are more interested in seeing a grand house, antiques, architecture, or manicured gardens, this is probably not the plantation for you. There are also not as many activities or amenities offered here as in some of the larger and more well-established Charleston plantations that have been open to tourists for decades. But it is a great place for anyone wanting to learn more about the African American experience and the local Gullah culture. 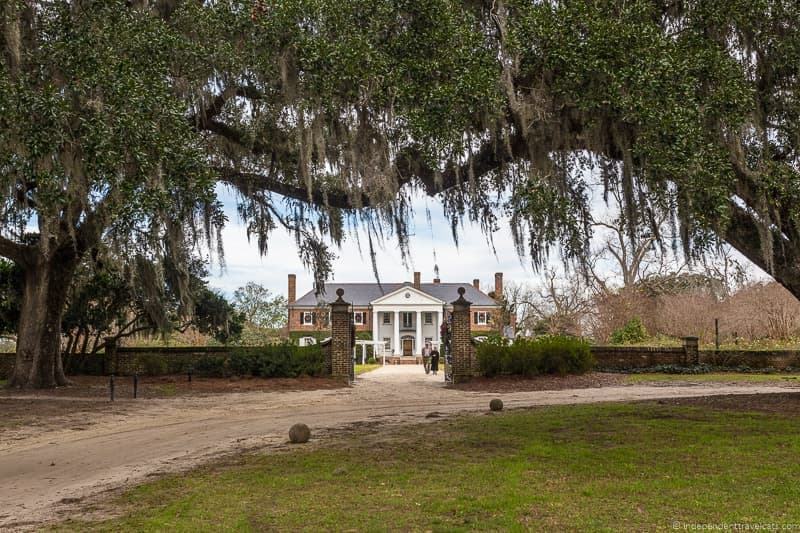 It is, of course, not the only Charleston plantation that includes good information on slavery or Gullah culture, but it is the only one in the area to focus on it almost exclusively. The Drayton family, owners also of the previously described Magnolia Plantation, owned a huge network of commercial plantations in South Carolina and Georgia. John Drayton, who had Drayton Hall built, was actually born on nearby Magnolia Plantation, but would move down the Ashley River to establish his own residence in 1738. Drayton Hall survived both the American Revolution and the Civil War, and is the oldest surviving plantation house along the Ashley River. It is also considered one of the finest examples of remaining Palladian architecture in the United States. In recent years, a lot of development and new offerings have been added to the Drayton Hall estate. 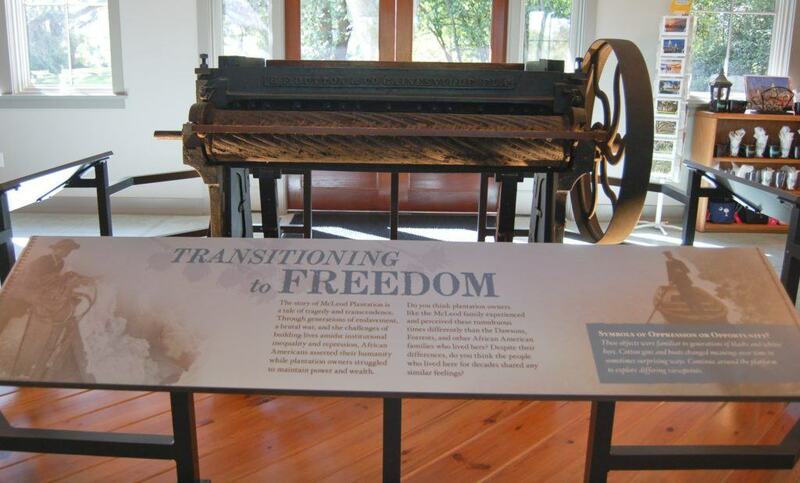 Since 2018, the plantation museum has opened a new visitor center, exhibition space, garden, and a cafe. Original Date of Main Plantation House: Drayton Hall was established in 1738, and construction of the house was likely completed circa 1750. Main Cash Crop: Rice and indigo. After the Civil War, the land was also used for phosphate mining. Owners: John Drayton purchased the property in 1738 and the Drayton family would own the property and live here for generations. The Drayton family decided to sell Drayton Hall to the National Trust for Historic Preservation and the State of South Carolina in 1974. Today, Drayton Hall is a National Trust Historic Site and is run and operated by the Drayton Hall Preservation Trust. Tours/Tour Guides: The main house can only be visited on a guided tour, but the grounds, gallery, caretaker’s house exhibit, and cemetery are self-guided. For those interested in slavery, a special guided tour focused on slavery and the Lowcountry economy is offered twice a day. Tour guides are not costumed. Main House Furnishings: The house is largely unfurnished and has been conserved and preserved rather than restored to allow visitors (and researchers) to be able to see the original construction, materials, and architecture. There are a number of archaeological finds, pieces of furniture, art, letters, etc. that can be seen in the Gates Gallery, including items owned by the Drayton family. Other buildings to visit on property: In terms of historical buildings, there is a c. 1870 caretaker’s house that is used as an interpretive space and also a large 7-person c. 1791 privy. Other places to visit on site include the newly-built Visitor’s Center and Stephen and Laura Gates Exhibit Gallery. Slavery Information: The best way to learn about slavery at Drayton Hall is to take the interpretive guided tour focused on slavery offered twice a day here. Drayton Hall’s African-American Cemetery is one of the oldest African-American cemeteries still in use, dating from at least 1790. The Caretaker’s House was built after Emancipation and the exhibit here focuses on the lives of African Americans at Drayton Hall after the Civil War as many families continued to live and work here in maintaining the house, grounds, and doing phosphate mining until around 1960. There is also information and objects related to slavery and the lives of African American at Drayton Hall in the Visitor Center and Gates Gallery. Gardens: There is a small formal courtyard garden. The Lenhardt Courtyard Garden was planted in 2018 and features a 200-year-old oak tree as well as plants that would have been at Drayton Hall in the 18th and 19th centuries. Photography Allowed: Yes, photos are allowed everywhere including in the house. Tripods and drones are prohibited on the property. Food: Rudi’s Cafe offers European-style sandwiches, meat and cheese plates, snacks, coffee, and drinks. They even offer wine and beer. Gift Shop: There is a gift shop located in the Visitor Center. Accessibility: The main house and 18th century privy building are not wheelchair accessible. For the house tour, visitors need to climb 39 stairs to do the full tour; however, a partial tour to see the main level of the house is possible and involves 16 stairs and supplemental materials can be provided for the short period when the tour visits the top floor of the house. The privy involves 3 steps. The Visitor Center, Gates Gallery, Caretaker’s House, cafe, and shop are all wheelchair accessible and can be accessed without stairs. Most paths are also wheelchair accessible although some paths are unpaved and may require assistance. Days Tours Available from Charleston: None of the tours (of which we are aware) currently include Drayton Hall. 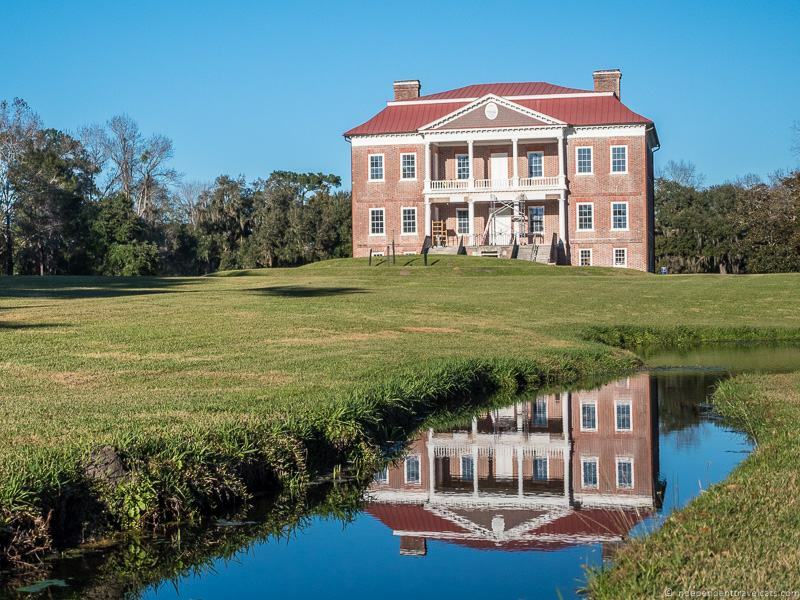 Most Unique: Drayton Hall is the oldest surviving plantation house on the Ashley River. It’s also one of the oldest and finest examples of Palladian architecture in the United States. In our opinion, Drayton Hall has the most impressive plantation home of all the Charleston area plantations. First, because it is a grand Palladian building made of red brick with a 2-storey white columned portico. But second because it is an original house that has stood on this site since c. 1750, whereas many of the other plantations in the area lost their grand antebellum houses during the Civil War. This house not only survived the Civil War and Great Earthquake, but it also survived the American Revolutionary War. It is too bad that many of the other plantation buildings on the estate did not survive the wars and natural disasters over the centuries. The house, for instance, had two flakers which were destroyed by natural disasters in the late 19th century. We also enjoyed learning about the history of Drayton Hall, from being used by General Cornwallis during the American Revolutionary War to being kept running through leases for phosphate mining. The fact that the house stayed in the hands of the same family and has been preserved, rather than restored or rebuilt, allows you to see and better understand the building materials, construction methods, and architectural features. Of all of the plantations, the house tour provides the most information related to the construction and architecture of the house. We visited Drayton Hall prior to all the recent additions and development, and at that time there was just the guided house tour and the grounds to explore. The house tour was definitely a highlight here and we enjoyed a short wander around the estate and visit to the African American cemetery. We would be excited to return to see the new exhibits and gallery and do the slavery tour. It is also great that there is now a gift shop, and café. I think these additional attractions and services really make it a much more engaging stop and allow visitors to spend more time here. Be sure to leave enough time to enjoy everything that Drayton Hall has to offer. Middleton Place Plantation is a National Historic Landmark, rich in history and natural beauty. The Middleton family which lived here were important figures in colonial America and residents of Middleton Place included a president of the First Continental Congress, a singer of the Declaration of Independence, a governor of South Carolina, and a signer of the Ordinance of Secession. Middleton Place would go through a lot of troubling times. On February 22, 1865, Union troops plundered the plantation and set fire to the Middleton Place home. The main house and south flanker were damaged beyond repair, and later reduced to rubble by the Great Earthquake in 1886. But the family was able to rebuild the north flanker in 1869 and use that as their new residence. Beautiful landscaped gardens were designed and planted by Henry Middleton in the 1740’s but these would be ruined and largely neglected after the Civil War. However, their restoration and expansion in the 1920’s would breath new life into this grand estate. Today the gardens are recognized as the oldest landscaped gardens in America and one of the most important. Middleton Place has also been used as a filming location, perhaps most notable during the filming of the 2000 film The Patriot. The house serves as the setting where the British officers are having a ball and watch fireworks in the film. Original Date of Main Plantation House: Originally there were 3 main plantation house buildings. The original main plantation house was built circa 1705. Two flankers (dependencies) were built to the north and south around 1755. The main house and flankers were burned by the Union troops in 1865. The south flanker, which had served as a gentlemen’s guest quarters and business office, was the least damaged and was rebuilt in 1869 as the family home and is the house you see today. Architectural Style: The main house (now destroyed) was a 3-storey brick house and was likely Georgian in style. The flankers were also Georgian in style, but the rebuilt flanker now standing is more Dutch Revival in style. Working plantation today? : No, but there is a demonstration rice field where rice is still planted. Owners: The original plantation house (ruins) is believed to have been built by John Williams, the home’s original owner, circa 1705. The house and estate were given as a gift by John to Henry Middleton who married his daughter Mary in 1741. Henry established the gardens and later built the North and South flankers. Later, the Middletons rebuilt the destroyed South Flanker in 1869 and it was lived in by the Middleton family up until 1975. 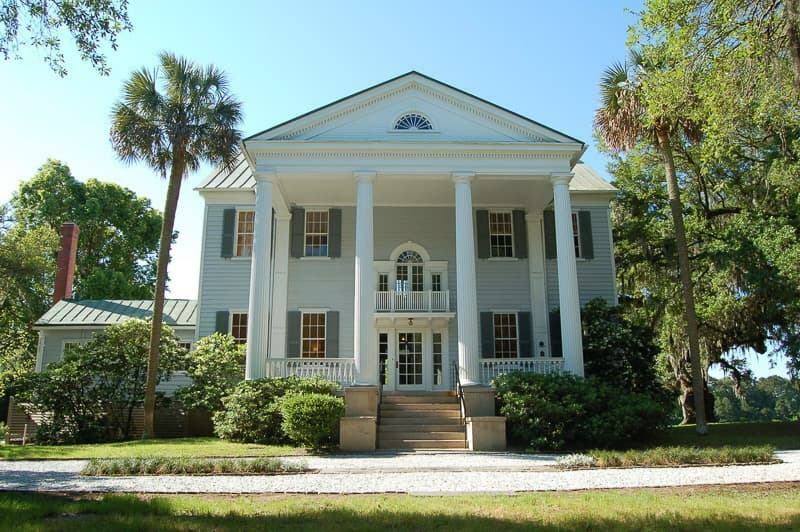 The house has been owned and run by the non-profit Middleton Place Foundation since 1974. Tours/Tour Guides: The main house can only be visited with a guided tour, but the grounds, gardens, and stableyards can be explored on one’s own. There are a variety of complimentary guided tours included with admission: a Garden Overview, Meet the Breeds (an introduction to heritage animal breeds), Beyond the Fields (black culture and slavery), and various seasonal Nature Walks. There is also a weather-dependent horse-drawn carriage tour of the grounds offered for an additional fee. Many of the tour guides House guides and many of docents doing craft demonstrations are costumed in period clothing. Main House Furnishings: The Middleton Place house is fully furnished and contains a large collection of furniture, art, documents, and family heirlooms from the Middleton family that date from the 1740’s to 1880’s. Other buildings to visit on property: There are a number of outbuildings on the grounds, including the spring house and plantation chapel (18th century springhouse with upper part used as a chapel from 1851-1865), rice mill (built in 1851), Eliza’s House (c. 1870 freedman’s house and slavery exhibit), and barn and stableyards (built in 1930’s, where you’ll find the animals and craft demonstrations). You can also see the ruins of the 18th century main house and north flanker as well as the slave cemetery. Slavery Information: A regular guided walking tour is offered called Beyond the Fields which focuses on the everyday life and culture of the enslaved workers. You can also visit Eliza’s House, which is a Reconstruction-era house used for African American freedman and is named after the last resident, Eliza Leach, who lived here until the 1980’s. The house contains exhibits about slavery and African Americans workings at Middleton Place after the Civil War. 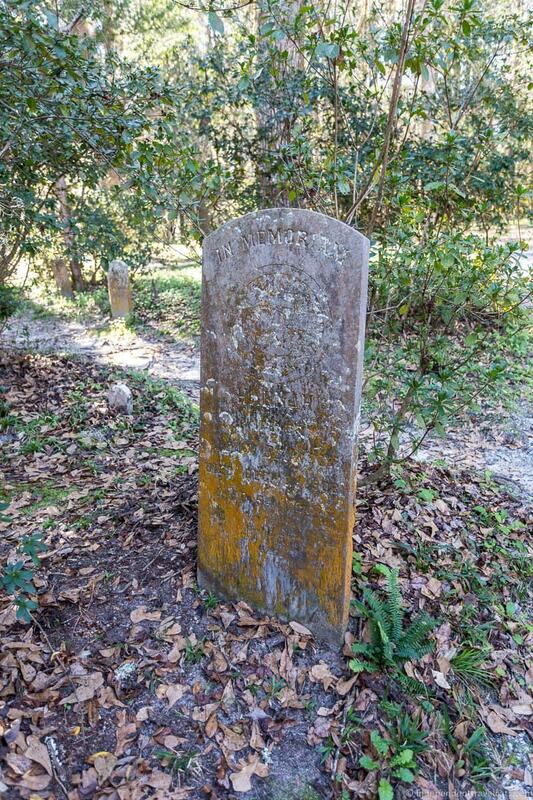 There is also a small slave cemetery with a few gravestones, but the exact location of the slave burials is unknown as some of these stones were relocated here to protect them from further damage. For more information about slavery here, you may want to check out the book Beyond the Fields and the film of the same name. Gardens: Middleton Place is well known for its 65 acres of lush gardens, and they are the oldest landscaped gardens in the United States. Henry Middleton began to lay out the gardens in 1741, inspired by formal gardens in England and France. After the Civil War, the gardens would become neglected, but they would be restored and expanded by J. J. Pringle Smith (descendant of the Middletons) and his wife Heningham in the 1920’s and they would also open them up to the public for the first time in the late 1920’s. The terraced gardens contain a wide variety of flowers and trees. Some notable features are the sundial garden, the abundance of camellias and azaleas, and the Middleton Oak (large old live oak tree). Photography Allowed: Yes, photography is allowed everywhere except in the House Museum. No drones allowed on site. Food: There are two year-round places to get food here. The Middleton Place Restaurant offers seasonal low country food in a sit-down setting; reservations recommended for dinner. The Garden Market is a causal spot to eat, selling sandwiches, snacks, ice cream, and drinks. Gift Shop: The Museum Shop sells historical books, art, accessories, and souvenirs. The Garden Market & Nursery sells plants, garden tools, crafts, and home accessories, including items handcrafted by the local artisans. Accessibility: The plantation House Museum is not wheelchair accessible; it requires 3 steps to enter the main floor and then two sets of approximately 16 steps to do the full tour. Eliza’s House requires 4 steps to enter. There are wheelchair accessible paths in the gardens (ask for a map at admission); however, many of the paths are compacted sand and gravel and can be difficult to navigate, especially in inclement weather. The restaurant, stableyards, Museum Shop, and garden center are wheelchair accessible, and there are handicap parking spaces and wheelchair accessible bathrooms. The Inn at Middleton Place has wheelchair accessible rooms. 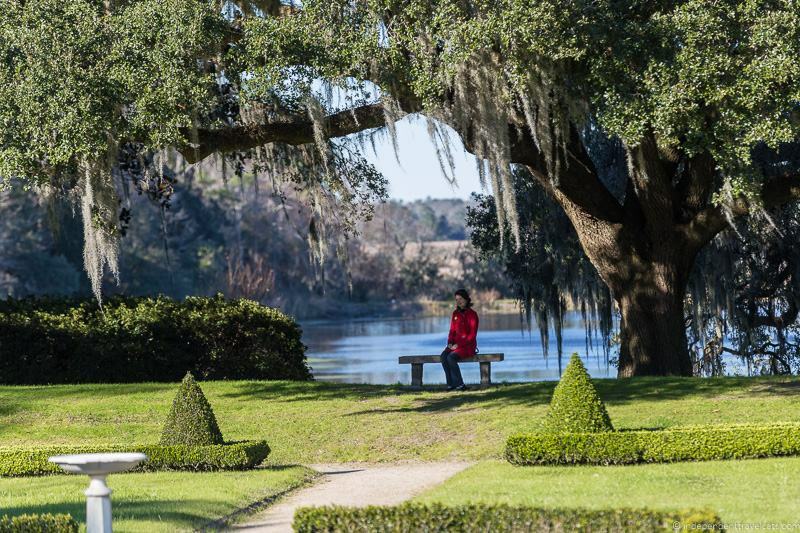 Days Tours Available from Charleston: This half day tour includes transport, Middleton Place admission and tour, and a 3-course lunch at the Middleton Place Restaurant. Lodging: The Inn at Middleton Place is a modern 55 guest room hotel located on the plantation estate along the Ashley River. Guests at the Inn have free access to the plantation along with complimentary breakfast, option to rent bikes and kayaks, and access to an outdoor pool. Crowds: Moderate to large; this is a popular spot. Most Unique: The plantation has the oldest landscaped gardens in the country and the house also contains a nice collection of 18th and 19th century antiques and furnishings. Middleton Place offers a lot for visitors to see and do. You’ll want to spend at least half a day here, although you could easily spend a full day here. A rushed visit here is sure to feel overwhelming as you’ll be forced to choose between tours and have limited time to explore the grounds. To get the most value out of your ticket, we recommend doing all the included talks and tours (slavery, gardens, animals) and seeing all the exhibits (Eliza’s House, craftspeople). The gardens here are special so take some time to wander around and appreciate them. The grounds also contain a number of outbuildings and historical sites that are worth seeing. For the tours that cost extra (house tour and carriage tour), we recommend the house tour to those who want to know more about the owners and who enjoy antiques. The house isn’t original but the current one does date to 1869 and served as the home for the Middleton family and their descendants until the 1970’s. It contains lots of antiques and family heirlooms, but may not be as lavish as some visitors expect. The carriage tour is OK but there isn’t a lot of unique information presented here if you do all the other tours. So if you want to save money, you can probably skip this one. Middleton Place offers the nicest on-site restaurant of all of the plantations so a great place to have lunch or dinner. But you can also grab a quick bite from the Garden Market. It is also the only plantation to offer on-site lodging, and this is an ideal place for visitors to stay who want a peaceful spot to stay outside of Charleston. A stay also gets you free entry into Middleton Place plantation, which is a significant savings for 2 people. Middleton Place is a popular option for families and groups as it offers a lot of options for those with divergent interests. The gardens give young children plenty of space to explore and they may also enjoy seeing the animals and watching the craft demonstrations by local artisans. The Charleston Tea Plantation is a bit different from the other plantations listed here. There’s no big house, slave cabins, or antiques. It is a modern 127 acre working tea plantation established in 1987 on Wadmalaw Island. Although the tea plantation is not that old, the history of tea growing in the Charleston area goes back to 1799 when French botanist François André Michaux planted some near Charleston Middleton Barony (now Middleton Place). Clippings from these plants were later grown at the commercially successful Pinehurst Tea Plantation by biochemist Dr. Charles Shepard Jr. from 1888 to 1915. Then in 1963, Lipton used clippings from the former Pinehurst Tea Plantation to grow tea at a research station on Wadmalaw Island at a former potato farm. In 1987, Mack Fleming and William Barclay Hall would take over this plantation and establish the Charleston Tea Plantation. Charleston Tea Plantation doesn’t have any of the historical plantations buildings of the others on the list, but it is still worth visiting if you are interesting in seeing a working plantation and are interested in seeing how tea is made. In 1995, an act was passed making South Carolina-grown tea the official state hospitality beverage in South Carolina! Main Cash Crop: Tea. Before it was a tea plantation, it was a large potato farm. Working plantation today? : Yes, tea is grown and processed here. Owners: The Charleston Tea Plantation was founded by Mack Fleming and William Barclay Hall, a third-generation tea taster in 1987. In 2003, David and Eunice Bigelow, of the Bigelow Tea Company, purchased the plantation from Hall. The tea is now owned by the Bigelow Tea Company but Hall is still very much involved with the plantation. Tours/Tour Guides: The main tour here is the Trolley Tour which is a 40 minute guided our of the plantation via a historical trolley. There are also free 15-minute video-guided factory tours where you can see how the tea is processed. Private tours are also possible with the plantation founder William Barclay Hall but need to reserved in advance. Other buildings to visit on property: The main building on the property for visitors is the Welcome Center which includes the gift shop and factory tour. On the Trolley Tour, visitors also stop at the plantations’ greenhouse to see where the tea seedlings are grown. Gardens: No formal gardens. There are some beautiful old live oak trees here. Food: There is a tea bar in the gift shop where visitors can sample both hot and cold tea. No food is served here, but you can purchase packaged snacks such as cookies, popcorn, and trail mix. Gift Shop: A large gift shop sells the tea from the plantation, tea-related items, body care products, snacks, souvenirs, and other items. Accessibility: The welcome center, factory tour, restrooms, and gift shop are wheelchair accessible and require no steps to visit. The trolley tour requires 4 steps to get into and out of the trolley. For those who cannot climb the 4 steps, a tour of the farm in a person’s own vehicle can sometimes be arranged with advanced notice. 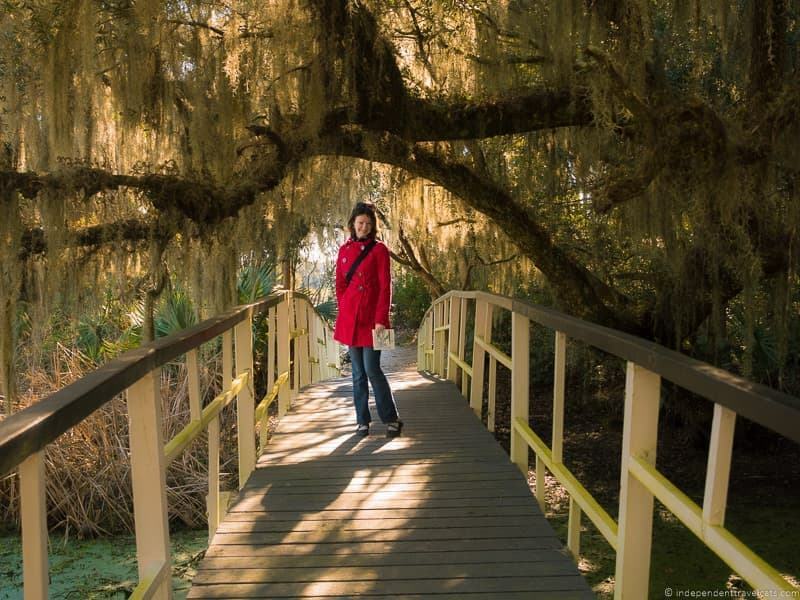 Days Tours Available from Charleston: This small group tour includes a visit and trolley tour of the Charleston Tea Plantation, a stop at Angel Oak, and a visit to the local winery and a distillery. Most Unique: Charleston Tea Plantation is one of only a few working plantations you can visit in South Carolina and it is the only commercial tea plantation in the United States. We enjoyed our visit to the Charleston Tea Plantation and it is a great place to learn about the process of tea making for any tea lover. We’ve visited tea plantations in other parts of the world (e.g., Vietnam and Sri Lanka) but it is great to be able to visit one in the United States. Although the history of the plantation itself only goes back to 1987, the history of tea growing in South Carolina goes back over 200 years. Today, Charleston Tea Plantation remains the only commercial tea plantation in the United States. The tram tour allows you to see the fields, see what a tea plant looks like, learn how they are planted and harvested, and see the young plants in the greenhouse. Then the factory tour tells you more about the plantation and shows you how the tea is processed and turned into what we buy on the shelves. 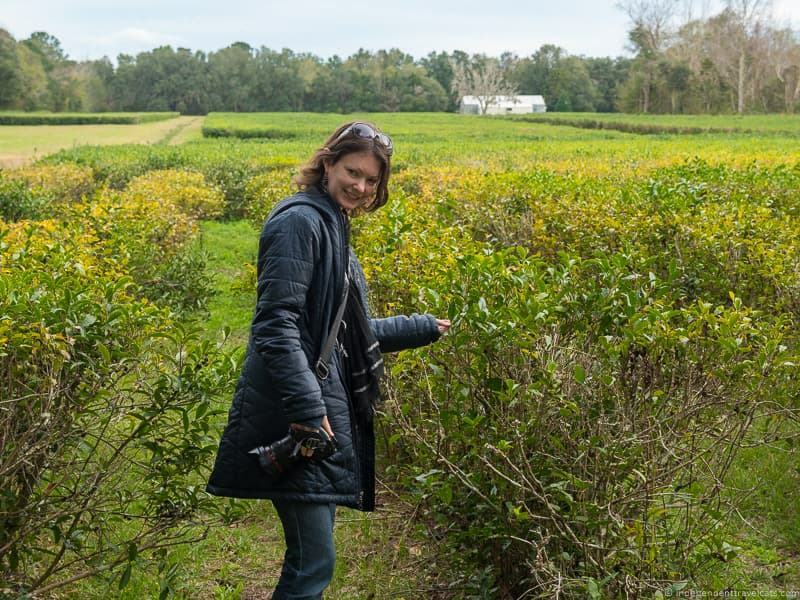 The Charleston Tea Plantation produces both black tea and green tea, and focuses on teas that taste good iced since most Americans consume tea cold rather than hot. Although the plantation is owned by Bigelow, the tea from the plantation is currently only sold under the American Classic and Charleston Tea Plantation brand names. Take some time after the tours to taste some tea samples and to have a look at the gift store. We purchased some of the plantation-grown tea here, but you can also purchase it online via the plantation’s website or on Amazon here. It is sold as loose leaf tea, tea bags, and bottled. Wadmalaw Island is a great place for producing beverages it seems, and there is also a winery, Deep Water Winery, and a distillery, Firefly Distillery, on the island. The distillery actually produces a sweet tea vodka and a sweet tea whiskey using the tea from the Charleston Tea Plantation. If you are interested in visiting the winery and distillery as well, you might consider this tour which allows you to sample as much as you wish without having to drive. It also makes a stop to see the over 400 year old Angel Oak tree. Remember that all of the plantations are located outside of Charleston, so you will need to either drive or arrange transportation. McLeod is the only one that is easy to reach by public transit. Day tours visit the plantations, see this list, but be sure to book them in advance. Be sure to check the admission ticket prices and what they include before you visit. Some of the plantations include all the tours and attractions in the price, whereas at others you will need to pay extra for each tour you want to take. If you are visiting other attractions in Charleston, we recommend checking out this tour pass, which includes some of the plantations and can help you save money on your trip. Leave yourself plenty of time to explore the plantations. It depends on the plantations but some you could easily spend half a day or more exploring and doing all the tours. Ticket prices can be fairly pricey and we recommend taking full advantage of your entry fee. If you are visiting the Charleston plantations in the Spring, summer, or early Fall, we recommend taking along insect repellent, especially if you plan to spend time wandering in the gardens, doing a boat tour, or doing outdoor walking tours. Mosquitoes can be particularly bad in the summer months. 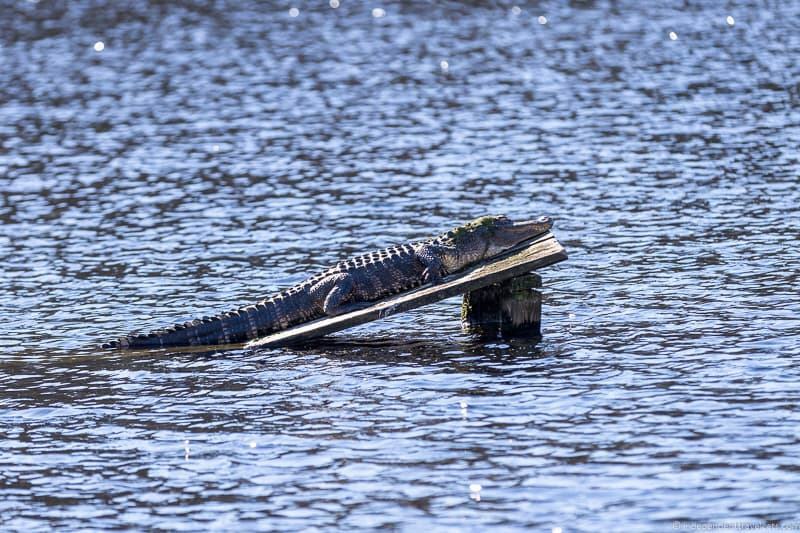 Be careful when walking in the gardens and nature trails at the plantations as there are alligators, snakes, and spiders living on or near many of the plantations. Although they rarely attack people with provocation, you don’t want to accidentally step on a gator or snake! Be sure to be keep children within eyesight when exploring. All of the plantations allow outdoor photography but most do not allow photography inside the main houses, exceptions being Drayton Hall and McLeod Plantation Historic Site. Most do not allow drones or tripods on site. If you have limited mobility or are traveling with someone with limited mobility or special needs, be sure that the things you want to see can be accessed. Some of the plantations are able to accommodate special requests but these normally need to be arranged in advance to guarantee staff availability. See the Accessibility section for each plantation above. Be prepared for the South Carolina heat and humidity, particularly if you are visiting in the summer months. We recommend wearing light-colored loose and comfortable clothing made of breathable fabrics. Hats and sunglasses are also a good idea, and don’t forget the sunscreen. Wear comfortable practical shoes. Many visitors are surprised by how much walking they do at some of these plantations. Most of the plantations have acres of gardens, nature trails, and grounds that can be explored on foot. Paths can be muddy. We recommend bringing along a reusable water bottle to stay hydrated and save money on purchasing drinks. We also recommend thinking ahead about meals as some of the plantations offer food and some don’t. For more trip planning information, check out our suggested 2 day Charleston itinerary. If your travels are taking you elsewhere in the South, you may also be interested in our suggested Deep Southeast road trip itinerary, things to do in Huntsville Alabama, things to do in Savannah, and our guide to Louisiana plantations. Have you been to any of these plantations in Charleston or have any of these on your must-see list? If you’ve visited any of these plantations, feel free to share any advice or tips of your own and please share any information updates. If you have any questions about visiting any of these Charleston plantations or visiting Charleston in general, feel free to ask us in the Comments section below. This is a trip definitely worth taking! We visited McLeod when we went a couple of years back. I have to say we went in June, and it was incredibly hot. I like hot weather, and I was surprised. We were sitting for the Gullah presentation and I felt the perspiration running down my back:) It was so interesting, though, and I learned so much. My parents just got back from a trip, and I think March is probably the perfect time. As always, thanks for such detailed information!